The community members have shown an incredible will for positive change. The tireless efforts of community members have catalyzed the various improvement efforts now underway in the plan area. It was at their request that the Balboa Park Station Area Plan was launched in 2000. Improve the economic vitality of the Ocean Avenue Neighborhood Commercial District. The Plan is comprised of eight chapters. The Land Use chapter aims to improve upon the existing land use pattern. The Transportation chapter addresses the area’s transit facilities and services. The Parking chapter establishes balanced parking policies and standards that promote quality of place. The Housing chapter encourages infill, transit-oriented development and family housing. The Street and Open Space chapter creates a system of parks, plazas, and open spaces. The Built Form chapter promotes an urban form and architectural character that sustains a diverse, active and safe public realm. The Historic Preservation chapter identifies and fosters appreciation of the historic resources in the plan area. The Public Art chapter integrates art into the fabric of the plan area. TheBalboa Park Station Area Plan includes the Ocean Avenue Neighborhood Commercial District and related zoning controls to ensure that new development meets the goals outlined in the Plan. The Area Plan also includes a Community Improvements Program. The Community Improvements Program identifies the projects described in the Area Plan and proposes a strategy to get them built. 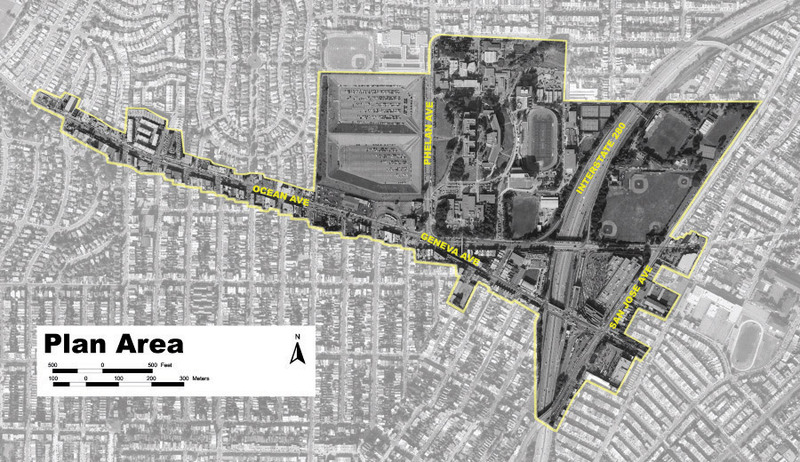 The “plan area” for the Balboa Park Station Area Plan is in south central San Francisco. The area comprises approximately 210 acres and includes the Ocean Avenue Campus of City College of San Francisco (CCSF), the Ocean Avenue Neighborhood Commercial District, Balboa Park, and the Balboa Park BART station. More specifically, the plan area consists primarily of those parcels fronting on Ocean, Geneva and San Jose Avenues. The area provides a diverse range of uses including; institutional, recreational, retail, housing, and transportation. Seven neighborhoods surround the Plan Area: Westwood Park, Ingleside, Ingleside Terraces, Miraloma Heights, Sunnyside, Oceanview, and Balboa Terraces. The plan area is best characterized by four distinct areas; the Transit Station Neighborhood, City College of San Francisco, the Reservoir, and the Ocean Avenue Commercial District. The Transit Station Neighborhood refers to the area immediately surrounding the Balboa Park Station. It is bounded by Interstate 280 to the west and residential neighborhoods on all other sides. Ocean Avenue Campus of the City College of San Francisco is on the north side of Ocean Avenue, east of the Ocean Avenue Neighborhood Commercial District. CCSF is bounded by Ocean Avenue to the south, I-280 to the east, residential neighborhoods to the north, and the Balboa Reservoir to the west. The campus occupies 67.4 acres and includes academic and support buildings, commons, open spaces, walkways and roads, and parking facilities. The Ocean Avenue Campus is the historical heart of the CCSF system and continues to serve as its flagship campus, serving the majority of its students. Balboa Reservoir is located on the west side of Phelan Avenue. It is bounded by Riordan High School and the Westwood Park residential neighborhoods to the north, and the Ocean Avenue Neighborhood Commercial District to the south. The reservoir is divided into two basins. The San Francisco Public Utilities Commission (SFPUC) owns the north basin, while CCSF owns the south basin. The Ocean Avenue Neighborhood Commercial District extends east-west along Ocean Avenue from Phelan Avenue to Manor Drive. This section is the land use plan for the Balboa Park Station Area Plan. Land use refers to the manner in which parcels of land or the structures on them are used. It establishes land use strategies to meet identified community needs. A core strength of the plan area is its diverse range of land uses, and the Balboa Park Station Area Plan land use goal is to strengthen the diverse land use, to build upon it, and to encourage the coordination of these uses. The Ocean Avenue Neighborhood Commercial District houses the primary commercial and retail uses in the plan area. It includes mostly neighborhood-serving shops and services. The commercial district is not as economically successful today as it has been in the past; many local residents travel elsewhere to shop. In addition, few City College students shop in the district, even though it is directly adjacent to their school. This plan aims to revitalize the commercial district. It does this by providing improvements to the way people access the area, by encouraging infill development and by creating a business improvement district. The City College of San Francisco is the largest single land use in the plan area. It and provides an enormous institutional amenity to the area. The college offers a wide range of educational programs and services on its approximately 67 acre site. The City College campus however does not relate well with the surrounding neighborhood: the school’s physical barriers assist in the lack of patronage to the nearby commercial district and to public transit. The plan aims to integrate the college with the community, the neighborhood commercial district, and the transit station area. The area is rich in open space and recreational facilities. Balboa Park is the largest public open space in the area, and is used by locals and visitors from throughout the city. The park provides four baseball fields, two large multi-use fields, tennis courts, a swimming pool, and other park amenities. However, the park needs to be renovated, and the physical and visual linkages to Balboa Park from the surrounding neighborhoods need to be improved. More discussion regarding Balboa Park is provided in the Streets and Open Space Chapter of the plan. Few San Francisco locations outside of downtown approach the level of transportation services offered in Balboa Park. The Balboa Part BART station is the busiest in the system, after the four downtown San Francisco stations. BART provides high-speed, high-frequency service to downtown San Francisco, SFO, and the East Bay. In addition, the San Francisco Municipal Railway (MUNI) serves the area, with the 29-Sunset, 49-Van Ness-Mission, 43-Masonic, 15-Third Street, 54-Felton, 88-Bart Shuttle, 36-Teresita, 26-Valencia and the MUNI metro lines J-Church, K-Ingleside, M-Ocean View. The Balboa Park Station Area Plan strives to capitalize upon the high levels of service in the neighborhood. This land use plan aims to encourage and support the growth, coordination, and accessibility of land uses in the plan area. Integrate the diverse uses in the plan area around THE commercial spine and transit node. A principle objective of this plan is to increase accessibility to, from, and within the plan area. It does this through street and transportation enhancements that will help to revitalize the Ocean Avenue Neighborhood Commercial District with its surrounding neighborhoods and with transit. It also creates a new neighborhood around the Balboa Park Bart Station. Strengthen the link between transportation and land use. The plan area already has excellent transit service, and transit services along Ocean Avenue serve the Neighborhood Commercial District well. However, the transit, pedestrian and biking experience needs to be improved to help enliven the street, create a more pleasurable shopping experience, and improve overall accessibility within the plan area. STRENGTHEN THE OCEAN AVENUE NEIGHBORHOOD COMMERCIAL DISTRICT. A successful San Francisco neighborhood offers a full complement of retail stores, conveniently located so local residents can shop for everyday goods and services without relying on automobiles. The Ocean Avenue Neighborhood Commercial District serves some, but not all, of the local population’s needs. A comprehensive program is needed to revitalize the commercial district and should include improvements to the access in the district. It should also encourage infill development that brings more housing and activity to the street and it should create a business revitalization partnership between the merchants, community members, and the city. Improve access to and from the commercial district. Accessibility plays a key role in the success of a commercial district. The plan proposes to increase accessibility from public transit to the commercial district by redesigning the connection between Ocean Avenue and the Balboa Park Bart station. It aims to increase accessibility from City College by reconfiguring the Phelan Bus Loop. In addition, streetscape improvements along Ocean Avenue, street tree plantings, and traffic calming measures within the surrounding residential neighborhoods aim to make the pedestrian environment more amenable to those who would walk to nearby shopping. Encourage mixed-use residential and commercial infill within the commercial district. The commercial district offers opportunities for parcels to be redeveloped over time. These small projects can add to the housing stock on upper floors and improve retail spaces on the ground floor while maintaining the district’s fine-grained character. In addition, the larger parcels around the Phelan Loop area provide an opportunity for development of additional new housing and a few larger-scale retail uses, such as a food market. Retain and improve the neighborhood’s existing businesses while also attracting new businesses that address unmet retail and service needs of the diverse local neighborhoods. The primary customer base of the neighborhood commercial district consists of residents of the surrounding neighborhoods, although a few specialty retailers draw customers from a broader region. However, residents presently make a significant portion of their retail purchases at other shopping districts both within and outside of San Francisco. The Ocean Avenue Neighborhood Commercial District could increase its success by capturing a greater share of local residents’ spending as well as catering better to transit patrons and City College students and faculty. The commercial district would benefit greatly from a coordinated program to improve the business environment. 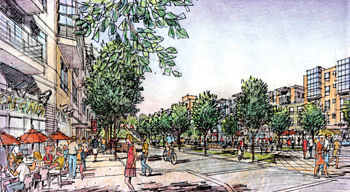 ESTABLISH an active, mixed-use neighborhood around the transit station. Transit-oriented development has the added benefit of adding life and vitality to the area around a transit node, making walking and using the transit system more pleasant and safe. Regionally, creating a network of transit-oriented developments that concentrate housing density and other development activity around transit nodes has the potential to foster greater mobility, reduce auto dependence and pollution, and reduce pressures for urban sprawl. The transformation of the Transit Station Neighborhood into a functional transit hub and mixed-use neighborhood is a central focus of this plan. The area around the Balboa Park Station should be reinvented as a vital urban transit village: a transit hub and a new neighborhood that support one another to create a truly unique place for daily commuters and neighborhood residents alike. Mixed-use housing and retail should be the principal land use in the Transit Station Neighborhood. Housing and retail around the station will help to enliven the area while providing needed housing. Ground floor retail space should be focused on neighborhood-oriented shops and services. Individual retail uses should not be larger than 5,000 square feet to create a fine-grained, pedestrian-oriented character. Auto-oriented uses should be prohibited. Encourage centers for cultural enrichment in the Transit Station Neighborhood. The plan aims to enhance the area’s cultural diversity by providing opportunities for cultural centers and art enrichment programs. The Geneva Office Building, built in 1901 and used for almost a century as an office building for transit workers, is an important neighborhood landmark at the corner of Geneva and San Jose Avenues. Restored to its former state, this handsome building would serve as an anchor for the revitalization of the entire Transit Station Neighborhood. 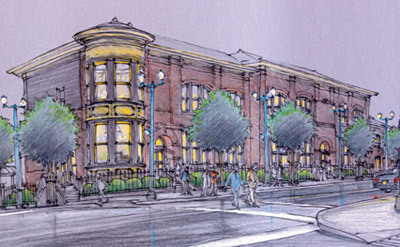 Rendering of a restored Geneva Office Building. DEVELOP THE RESERVOIRS IN A MANNER THAT WILL BEST BENEFIT THE NEIGHBORHOOD, THE CITY, AND THE REGION AS A WHOLE. The Balboa Reservoir represents one of the largest remaining undeveloped sites in San Francisco. The reservoir, which has never contained water, is approximately 25 acres in size, and currently forms an unpleasant void in the neighborhood. This Plan encourages the owners of this site-to develop the reservoir in a manner that will best benefit the neighborhood, the city, and even the region as a whole. Develop the east basin of the reservoir to provide additional educational facilities while enhancing existing college and community services. In 1991, the San Francisco Public Utilities Commission (PUC) transferred the east basin to City College, while retaining ownership of the west basin. The college intends to develop the east basin for expanded campus facilities and underground parking. Development on the east basin should respect the existing north to south grid established in the neighborhood south of Ocean Avenue and the east-to-west axis established by the existing staircase leading to the main building on the City College campus east of Phelan Avenue. The physical and visual continuation of these existing patterns through new development on the east basin will help create appropriately sized blocks of a size similar to those in the surrounding neighborhoods, promoting walkability and strong physical and visual connection with the surrounding areas. Develop the west basin of the reservoir the greatest benefit of the city as a whole as well as for the surrounding neighborhoods. If the PUC should decide that the west basin is not needed for water storage, it should consider facilitating the development of a mixed-use residential neighborhood on part of the site to address the city-wide demand for housing. The development on the site should recognize the opportunity to knit the surrounding neighborhoods together through the creation of a community open space and pedestrian connections. If the PUC does move ahead to use the west basin for water storage, it should provide a roof structure on top of the new water tank, to allow the development of a community park or open space. Plan for physical changes at the City College of san francisco. City College is the largest institution and use of land in the plan area; approximately 27,000 students attend CCSF daily. The college represents an important asset for the area. Few other neighborhoods in the city are able to enjoy such close proximity to the cultural, recreational, and educational offerings provided by the college. The College’s Master Plan was completed in 2004. The Master Plan provides a comprehensive strategy for the development of grounds and facilities to meet the College’s needs through the year 2015. The Master Plan evaluates existing campus conditions relative to institutional needs, and recommends projects necessary to meet these needs.1 The Master Plan incorporated community issues and concerns that are also addressed in this plan and include; improve campus image, support Ocean Avenue retail, encourage pedestrian connections to and from Ocean Avenue, resolve parking impacts, support improvements to transit facilities, mitigate neighborhood impacts from development and to involve the local community.2 As the campus changes and grows, CCSF should seek to reach out and connect with the Transit Station Neighborhood and the Ocean Avenue Neighborhood Commercial District. The existing college campus, and future expansions, should be better integrated with the surrounding neighborhood and the transit station. City College represents an important but underutilized asset for the area. Currently, the campus is disconnected from its commercial district. As the college grows in the future, it should reach out and connect to the Transit Station Neighborhood and to the Ocean Avenue Neighborhood Commercial District, helping to enliven the areas and provide customers for businesses. The area’s institutional, commercial, and residential uses and amenities provide a good opportunity to increase transit ridership and to promote walking and biking. Approximately 27,000 students attend CCSF daily, the surrounding residential communities provide family housing, and the neighborhood commercial district is characterized by close-knit shops located directly adjacent to light rail lines and bus services. Students, residents, and shoppers need to be encouraged to use the transit that so adequately services this district. Links need to be strengthened to existing land uses in the plan area through the re-design of streets and streetscape improvements, and improved transit access. Adding housing above the shops along Ocean Avenue has the dual benefit of strengthening the commercial district and increasing transit use. The area around the Balboa Park BART Station needs to be developed with a broad mix of uses – providing transit riders with the services they need. Developing the large, unused parcels within the transit station neighborhood will reduce the area’s large scale, enhance walkability, and create smoother connections with the surrounding residential communities and City College. Successful transportation systems depend on connections between modes and ultimately, the ability to travel in the least amount of time, safely and comfortably. The different transportation services in the plan area are poorly connected. This lack of connectivity slows travel time, is inconvenient, and in some cases, unsafe. Reconfiguring and improving the transportation network will benefit the neighborhood and the citywide transportation network. Good transportation policies play a strong role in the creation of a livable place. This chapter establishes policies to strengthen the connection between land use and transportation. EMPHASIZE TRANSIT IMPROVEMENTS THAT SUPPORT THE Neighborhood. The level of transportation service in the plan area provides a strong case for increasing the area’s development potential. Existing transportation services and facilities should be redesigned and rehabilitated, and circulation networks should be reconfigured to create stronger connections between land use and transit. BART recently completed the Balboa Park Comprehensive Station Plan (CSP), developed in tandem with the Balboa Park Station Area Plan and with support from partners including the City, MUNI, BART, Caltrans, City College, and neighborhood groups and residents. The overriding goal of the CSP was to create a consensus of public agencies for future development and included transit improvements in the Transit Station Neighborhood. Redesign the Balboa Park BART Station as a regional transit hub that efficiently accommodates BART, light rail, buses, bicycles, pedestrians, taxis and automobile drop-off and pick-up. The Balboa Park Station is the busiest BART station outside of downtown San Francisco. Eight Muni bus lines serve the area, as do three Muni Metro lines. In addition, the station is popular with drop offpassengers because of the station’s close proximity to Interstate 280. The station was opened in 1973 and is confined between the I-280 and the Muni light rail tracks. The station is poorly designed; accessibility is compromised and signage is lacking. Simply put, the current design does not realize the station’s potential. Redesigning the station is a key transportation improvement in the plan area, it would highlight the station as an important neighborhood resource; a place for people to gather; and an efficient transit hub. Reconfigure the Phelan Bus Loop to encourage public transit use and strengthen the connection between transit and land use. The Phelan Loop has the potential to link the Transit Station Neighborhood with the Ocean Avenue Neighborhood Commercial District and City College. The existing Phelan Bus Loop disrupts the urban fabric at the eastern edge of the Ocean Avenue Neighborhood Commercial District and breaks the connection between this transit node and its commercial corridor. The existing Phelan Loop parcels as currently configured provides little amenity for the transit rider and a poor connection to the adjacent City College. A redeveloped Phelan Loop would function simultaneously as a new front door on Ocean Avenue for City College and as a gateway to the commercial district. RECONSTRUCT AND RECONFIGURE MAJOR STREETS IN THE PLAN AREA TO ENCOURAGE TRAVEL BY NON-AUTO MODES. Streets constitute a large portion of the plan area’s public space; their quality can affect the success or failure of a neighborhood as a livable place. The plan area’s main streets of Geneva, Ocean, Phelan, and San Jose Avenues encourage the fast movement of cars, contain circuitous pedestrian routes, have misaligned intersections, and often have a generally cluttered street environment. Retrofitting these streets will improve the public realm and enhance neighborhood identity. Ensuring a balanced mix of travel modes with special attention to pedestrians and street life will help make the area more enjoyable. Re-design Geneva Avenue as a new front door to the BART station. Geneva Avenue, between Ocean and San Jose Avenues, should be reconstructed to gracefully accommodate the large volume of pedestrians, bus loading, passenger drop-offs, and through automobile traffic. The street must accommodate all these activities while remaining an attractive and comfortable place for people to be. Re-design San Jose Avenue between Ocean and Geneva Avenues to better accommodate public transit while maintaining its character as a residential street. San Jose Avenue between Ocean and Geneva Avenues is a residential street that accommodates streetcars as they approach the Balboa Park BART station. Design improvements should be made to this street, including reserving a lane for transit vehicles, adding transit boarding platforms, and improving the existing transit boarding platforms. Sidewalks should be improved, specifically on the western side just south of Geneva at the current bus stop, to create more pedestrian space for this high activity corner. Re-design Ocean Avenue as a transit and pedestrian boulevard. Ocean Avenue should be redesigned as the key pedestrian connector in the plan area. This street should be a tree-lined boulevard that emphasizes pedestrian, transit and bicycle movement while still adequately accommodating auto traffic. This street should be redesigned to improve pedestrian safety and include a modification of the Ocean, Phelan and Geneva Avenue intersection. An improved intersection would accommodate bike lanes, shorten crossing distances for pedestrians, and tighten turning radii for automobiles. New bicycle lanes should be provided to allow bikes to reach City College and the Ocean Avenue Neighborhood Commercial District from the BART station. A planted center median should be installed between Phelan Avenue and the entrance to the freeway deck. The existing Muni K-line platforms under the overpass should be removed and rebuilt. Streetscape improvements should also be included in this redesign and include appropriate street lighting, street trees, and curb bulb-outs. These improvements should build on the work that has already been done on the western end of Ocean Avenue. Re-design Phelan Avenue in a manner befitting a campus-oriented street. Phelan Avenue between Ocean and Judson Avenues is currently a main thoroughfare for City College students and the neighborhoods to the north. It is also an access point for college-related parking in the reservoir. As the campus expands onto the reservoir, Phelan Avenue will take on more of the character of an internal campus street. This street should be redesigned to be more pedestrian friendly and to accommodate bicycle lanes serving the neighborhoods to the north. Rendering of a redesigned Geneva Avenue looking Southeast (towards Upper Yard development). Reconnect the neighborhoods bisected by the Interstate 280. Interstate 280 separates the area’s neighborhoods and is a considerable source of noise. Ocean and Geneva Avenues cross the freeway by way of an overhead bridge. The ramps create an unpleasant condition where they meet the city streets; pedestrians walking between the transit station and surrounding areas are forced to cross multiple intersections. Minimize the prominent physical barrier of Interstate 280. Section through the freeway deck and transit center. Freeway deck and Single Point Urban Interchange. This plan proposes two projects that would minimize the negative impacts of the I-280. The first shorter term project would reconfigure the freeway ramps to make them safer for pedestrians and to improve traffic congestion. The plan proposes the development of a single point urban interchange (SPUI). The SPUI would bring together the ramps to a single point above the freeway and then connect them with a roadway between Geneva and Ocean Avenues. The second, longer term, project is the construction of a deck over the freeway. The deck would be constructed to support the SPUI and fill the freeway between Ocean and Geneva Avenues. A connecting roadway would run along the center of the deck, and would be lined by the new inter-modal terminal, new mixed-use buildings, and a public open space. The construction of the SPUI and deck would simplify the interchange between the freeway and city streets; reducing the number of pedestrian and auto conflict points and help ing to reconnect the neighborhoods. Encourage walking, biking, public transit as the primary means of transportation. The plan area has a diverse array of land uses and an infrastructure rich in transportation services. Walking, biking, and public transit complement the area’s urban character of small closely spaced houses, a fine-grained walkable shopping district, and the availability of transit. This plan encourages walking by proposing streetscape improvements and traffic calming measures. It encourages bike riding by proposing stronger bicycle connections. It also encourages the use of public transit by proposing to increase transit reliability and comfort. Main streets in the plan area should be civic spaces as well as movement corridors. Streets that support and invite multiple uses, including safe and ample space for pedestrians, bicycles, and public transit, create a conducive setting for the public life of an urban neighborhood. Well-designed, multi-functional streets become important urban public spaces. Streets must be comfortable for pedestrians and functional for all types of travel. The main streets in the plan area – Geneva, Ocean, Phelan, and San Jose Avenues – should emphasize pedestrian, bicycle, and transit movement, while allowing for auto travel. On smaller streets the comfort of pedestrians is paramount. Improve and expand bicycle connections throughout the plan area. There is a significant opportunity to boost cycling in the plan area; street grades are relatively flat for San Francisco, there are excellent regional transit connections, and a strong student population represents a potential pool of cyclists. Official city bike routes serve the plan area on Ocean, Geneva, Phelan, and Holloway Avenue. Currently, these bike routes do not have dedicated bicycle lanes. This plan improves access and road conditions for cycling by proposing bike lanes on Ocean and Phelan Avenues, and a by providing bicycle improvements along Holloway Avenue, connecting City College with San Francisco State University. All bike improvements proposed in the Balboa Park Station Area Plan must comply with the City’s Bike Plan. Improve travel time, transit reliability, and comfort level on all modes of public transportation. To encourage more people to use transit, the travel experience must be pleasant. The quality of the transit experience should be improved through well-designed stops and stations. In addition, signal pre-emption for transit vehicles can help reduce the ‘bunching’ together of transit vehicles by allowing a bus or streetcar to pass through intersections with minimal delay. Stops signs slow transit service and should be minimized and replaced by signals with preemption on transit preferential streets. Despite the vast array of transportation services offered in the plan area, many people still drive to fulfill their daily needs. As a result, parking is a primary concern among the residents in the surrounding neighborhoods and with the merchants in the Neighborhood Commercial District. The land uses in the area, namely the City College of San Francisco, the Ocean Avenue Neighborhood Commercial District, the Balboa Park BART station, and the Muni service yards, create a competitive parking situation for the residents in the surrounding neighborhoods. City College draws students and staff to its facility; many drive their cars, creating congestion in the areas surrounding the college. The merchants along Ocean Avenue recognize the importance of on-street parking availability to the success of their businesses and are discouraged by the current low turn-over rate. The BART station is the southernmost station; encouraging some to ‘park and ride’ or to be dropped off. Ironically, the transit services themselves generate traffic; the Muni offices and service yards bring employees who may drive to work. Balanced parking policies are a critical component to creating a livable neighborhood. As a result, the Plan takes a comprehensive approach to address the negative impacts of parking in and around the plan area. First, the Plan provides modal choice; it enhances transportation services, and encourages walking and biking through redesigned streets and improved streetscapes. Second, the Plan prioritizes parking for residents, shoppers, and visitors to the area by revising the residential permit parking system. Lastly, the Plan proposes parking management strategies to be implemented after a parking survey of the area is completed. Establish parking standards and controls that promote quality of place, affordable housing, and transit-oriented development. The plan area cannot become a better place without a balanced series of parking policies. If more parking is provided, it will generate traffic. If parking policies are too strict, they may have the effect of making life difficult for residents. Balanced parking policies are critical to creating a livable neighborhood. Parking should be provided where needed, but care should be taken to avoid oversupply. Provide flexibility for new residential development by eliminating minimum off-street parking requirements and establishing reasonable parking caps. Eliminating minimum parking requirements allows developers the flexibility to tailor parking to the constraints of a site and to the needs of expected residents. Maximum requirements, by limiting the amount of off-street parking that may be provided, help to protect the qualities of a place, promote higher densities, reduce housing costs, and encourage transit use. Provide flexibility for non-residential development by eliminating minimum off-street parking requirements and establishing parking caps generally equal to the previous minimum requirements. Current minimum parking requirements for commercial and institutional uses of 10,000 square feet or less should be converted to maximums, with no required minimums. This will allow developers the flexibility to maximize retail and housing development in new mixed-use buildings near transit, while still permitting enough parking to serve appropriate uses. Make parking costs visible to users by requiring parking to be rented, leased or sold separately from residential and commercial space for all new major development. Currently most new ownership housing and some new rental housing has parking included in the base price of a unit. This encourages auto ownership and use because the cost for storing a vehicle is an already “sunk” and invisible cost. Individuals or families who do not own or may not need a car must often pay for the space anyway, needlessly driving up the cost of their housing. Where possible, parking spaces should be sold or rented to residents for a price separate from that of the unit itself. This will encourage only those who really need a car to pay for storing one and also serve to lower the cost of housing for those who do not need or want a car. Ensure that new development does not adversely affect parking availability for residents. Residents sometimes oppose new development because of worries that new residents will compete for scarce on-street parking spaces. Implementing parking management strategies, enhancing parking enforcement programs, and proposing alternatives to reduce the need for parking will help to ensure that new development does not adversely affect parking availability. Consider revisions to the residential permit parking program (RPP) that make more efficient use of the on-street parking supply. The city’s existing residential permit parking (RPP) system is intended to mitigate the impacts of commuters and other long-term non-resident parkers on residential streets while also accommodating short-term parking for visitors. The program, as it is currently configured, is only partially successful in its purpose of ensuring that adequate on-street space is available for permit holders. Channeling extra revenue from higher parking fees back into neighborhood improvements. These ideas, and others not yet identified, should be studied closely by the city’s Department of Parking and Traffic to identify their costs and benefits before proceeding to modify the RPP program. Manage the existing supply of on-street parking in the plan area to prioritize spaces for residents, shoppers and non-commute transit trips. The on-street parking supply in the plan area is put under pressure due to the proximity of transit and City College. Drivers from outside the neighborhood seek unregulated street parking in order to use BART or Muni. Likewise, students attending courses at City College often seek parking on neighborhood streets. Highest priority for the limited supply of existing on-street parking should go to residents on neighborhood streets (via a residential permit parking system) and shoppers on commercial streets (via parking meters). Effective enforcement will be required to make this prioritization system effective. A lower priority for access to on-street parking should be assigned to non-commute users of the transit station and employees of local businesses. City College parking demand should be reduced via programs to encourage use of non-auto modes and then be accommodated on dedicated off-street facilities. Promote car-sharing programs as an important way to reduce parking needs while still providing residents with access to an automobile when needed. Car-sharing programs have gained popularity in the last few years in many cities. Members of car-share organizations are able to quickly and easily access vehicles located in their neighborhoods for everyday trips without needing to own a car. These programs should be supported in the plan area to minimize the negative impacts of new development on parking availability. Increase the effectiveness and scope of the city’s parking enforcement program. Parking meters, residential permits, and other measures rely on enforcement if they are to work effectively to improve availability and prioritize spaces as intended. Regular, consistent enforcement is needed in the area. An enforcement program is also important at bus stops to improve transit reliability, to allow Muni vehicles to pull to the curb, and to maintain dedicated curb space for delivery vehicles, taxis and ‘kiss-and-ride’ functions. Carefully managed parking in the Phelan Loop Area. New residential and commercial uses in the Phelan Loop Area will generate demand for parking, though this demand can be expected to be lower than average due to the proximity of the Muni K-line and the Balboa Park BART station. There will be an opportunity to create new, metered, on-street parking spaces along the new street extensions in the Phelan Loop area. Off-street parking facilities can also be developed as part of new buildings on the various parcels. The following guidelines should govern the provision of parking in the Phelan Loop Area. Curb parking is desirable in all cases, and its availability should be maximized along Ocean Avenue, as well as along side streets. Curb parking should be managed according to the Balboa Park Station Area Plan Urban Design Guidelines in the Urban Design and Built Form chapter of this Plan. New metered curb parking spaces should be created in the Phelan Loop Area. These new spaces will be located along the extensions of Brighton and Harold Avenues. When a new building is developed on the Phelan Loop parcel, the street should be widened to allow the creation of metered curb parking along the north side of Ocean Avenue between Harold and Lee Avenues, where it has not existed in the past. Off-street parking, in structures and underground, should be centrally planned and managed for the entire Phelan Loop area, to the greatest extent possible. Central planning and management of parking in this area offers the opportunity to make the most efficient use of the fewest number of spaces, as well as to minimize the number of unattractive driveways and entrances. Involvement of the San Francisco Parking Authority should be explored. Spaces for car share and other innovative programs should be a part of the parking facilities in this area. Entrances to off-street parking should not be placed on Ocean Avenue. All parking entrances should be via Harold, Lee and Brighton Avenues. Openings providing auto access into garages should be as narrow as possible. Structured parking may be provided underground or within building podiums. In all cases parking should be screened from view from Ocean Avenue. Parking should also be screened from view, to the greatest extent practical, from the public spaces along the extensions of Harold and Brighton Avenues. Parking should be set back at least 25 feet from lot lines along Ocean, Harold and Brighton Avenues. There should be no minimum parking requirements attached to any land use. Parking for residential uses should not be provided at greater than one space per unit. Parking for commercial uses should not be provided at greater than two spaces per 1,000 square feet of occupied building area. Parking for commercial uses must conform to all other design and setback requirements set forth in this Plan. Ensure that new off-street parking does not adversely affect neighborhood character or the pedestrian friendliness of streets in the plan area. Curb cuts, leading to garages or surface parking lots, adversely impact transit service and the quality of the pedestrian environment as well as remove on-street parking and trees. They also introduce auto traffic across busy pedestrian sidewalks. Prohibit garage doors and curb cuts on neighborhood commercial and transit preferential streets. Curb cuts should be prohibited on transit preferential streets due to the delays they impose on buses and streetcars. This will have the effect of prohibiting off-street parking in new developments mid-block, but not in buildings developed on corners, where parking garages can be accessed from side streets. Establish parking policies to support revitalization of the Ocean Avenue Neighborhood Commercial District. Adequate short-term customer parking is one important element of a successful neighborhood commercial district. Currently, while parking along Ocean Avenue in the commercial district is easier than in most of the city’s busiest districts, spaces can be hard to find at peak times. Parking in the commercial district needs to be carefully managed so that it doesn’t detract from pedestrian, bicycle and transit access which is critical to a healthy district. Improve metered parking in the Ocean Avenue Neighborhood Commercial District. The local nature of the Ocean Avenue Neighborhood Commercial District means that most shopping errands can be completed within an hour, and in many cases, significantly less time. To maximize business for local merchants, parking should be managed to give priority to short-stay customers. Maximize existing off-street parking facilities in the commercial district for business owners and employees as well as for customers. Explore the potential for merchants and their employees to park in the reservoir. City College currently offers hundreds of parking spaces every day at the reservoir for $1 a day. There is a large number of surplus spaces that could be used to accommodate longer-term parking by merchants and their employees; freeing up more curbside spaces for customers. Though both City College and the Public Utilities Commission (PUC) have plans for using the reservoir in the future, they are unlikely to move forward for several years. In the meantime, the merchants association should explore whether City College would offer a monthly permit to local merchants and their employees. In addition, City College and the PUC should explore creating a pedestrian pathway that would connect the reservoir parking directly to Ocean Avenue. Consider the long-term need for additional public off-street parking only after all existing on and off-street parking opportunities have been exhausted. The use of scarce land in San Francisco for public parking lots or parking structures should be considered only as a last resort. First, all existing parking opportunities should be fully utilized. If parking demand warrants the construction of additional off-street parking it should only be developed as part of a new mixed-use development rather than as a standalone garage structure. Establish parking policies to support the new Transit Station Neighborhood. City policy strongly discourages the provision of all-day commuter parking at transit hubs and encourages access by public transit, walking, bicycling and passenger drop-off. One component to the development of this area is the management of on-street parking in a way that supports transit use and prioritizes curb space for support services and those who need it most. Provide off-street parking to serve BART or Muni employees should not be provided. Currently, there are parking spaces along main streets reserved for Muni employees who work at the Muni facilities in the Transit Station Neighborhood. Muni should ensure that the existing off-street parking facilities in the area which it currently owns or rents are being used to their full capacity before the city reserves curb parking space for Muni employees. Should additional parking be needed beyond that provided in its own off-street facilities, only enough curb spaces should be reserved to cover the shortfall for those employees who work late night and early morning shifts when transit is not available. Curb-side parking space in the Transit Station Neighborhood is limited, particularly after satisfying the needs of transit services for curb space to pick up and drop off passengers. This means that remaining curb-side parking spaces must be carefully prioritized for essential users, including local residents, who would be ensured parking availability through a revamped residential permit parking program. Prioritize on-street parking in the Transit Station Neighborhood for particular types of users. After critical functions are provided for, the next priority should be given to users of Balboa Park and to those who wish to park near BART for short term (non-commute) trips. Four-hour meters, or a different technology, can be used to make sure that commuters do not use neighborhood curb-side parking space for all-day parking. On the residential side streets around the station, parking should be prioritized for residents and their visitors, by means of the residential parking permit system and effective enforcement. Explore the extension of the validity of the Fast Pass on BART to the Daly City station. Currently many BART riders from northern San Mateo County park on the streets around the Balboa Park Station in order to be able to use a Muni Fast Pass to ride BART into downtown San Francisco, rather than paying the much higher regular BART fare from the Daly City Station. BART and Muni, in consultation with SamTrans and Daly City, should investigate the costs and benefits of extending the validity of the Fast Pass to Daly City Station. Housing above neighborhood-serving retail is one of the most important strategies for revitalizing the plan area. The development of new mixed-use buildings with housing above, carefully designed and affordable to a range of income levels, will enliven the streets, supply more customers for local businesses, and help address the city’s housing needs. The proximity of the neighborhood’s main streets to excellent transit service makes this an especially good place for housing. There are a number of opportunities to provide housing in the plan area; through incremental infill and through the development of underutilized lots in the area. The Ocean Avenue Neighborhood Commercial District has many underdeveloped sites; additional housing in this area will increase the customer base and enliven the area. Toward the eastern end of the district, the larger parcels around the Phelan Loop also offer more opportunities for additional new housing. The Transit Station Area is also surrounded by underutilized land. In fact, some parcels located directly adjacent to the Balboa Park BART station are currently zoned for single family housing. Transit station areas are ideal places to encourage new housing growth, as new residents and other activity can be accommodated without many of the negative impacts associated with growth, notably traffic. The transformation of this area into a functional transit hub depends on intensifying development in the area, which includes adding a variety of housing types. Focusing compact growth and density around this transit oriented area capitalizes on major investments in transit and brings potential riders and destinations closer to transit facilities, thereby increasing ridership. In addition to new housing in the plan area, the Plan aims to provide increased affordable housing opportunities and to preserve and enhance the area’s existing housing stock, resulting in a diverse housing mix that complements the surrounding neighborhoods, while supporting the services offered in the area. MAXIMIZE OPPORTUNITIES FOR RESIDENTIAL INFILL THROUGHOUT THE PLAN AREA. Successful San Francisco neighborhoods follow a consistent pattern. They generally include residential enclaves surrounding a vibrant, mixed-use commercial core. In most neighborhoods, the commercial core contains mixed-use buildings along main streets, with neighborhood-oriented stores and services on the ground floor and housing on upper floors. A critical mass of people living on or near main commercial streets is what gives urban neighborhoods their vitality, interest, safety, and convenience. Housing, supported by a modest amount of neighborhood-oriented commercial establishments, should form the backbone of all new development in the plan area. Significant gaps in development and activity along streets caused by underutilized land or the intrusion of major infrastructure can make even very close areas seem distant, isolated and unconnected. Filling in these gaps with active mixed-use buildings will connect isolated sections of the plan area. Ocean Avenue and San Jose Avenue present opportunities for infill housing while the transit station area and the reservoir area provide opportunities for larger housing developments. Eliminate dwelling unit density maximums. Dwelling unit density maximums unnecessarily constrain the number of dwelling units that can be built on a given lot. Eliminating density caps allows developers the flexibility to construct the type of unit that reflects market realities. STRENGTHEN THE OCEAN AVENUE NEIGHBORHOOD COMMERCIAL DISTRICT BY PROVIDING AN APPROPRIATE MIX OF HOUSING. A comprehensive program is needed to revitalize the commercial district and should include infill development that brings more housing and activity to the street. The commercial district offers opportunities for parcels to be redeveloped over time, either through additions on upper floors, or on the potential development sites in the Phelan Loop Area. Encourage mixed-use commercial and residential infill within the commercial district while maintaining the district’s existing fine-grained character. Over time there will be opportunities to replace some existing structures in the commercial district. Infill on these parcels with mixed-use developments containing up to three floors of housing, and retail space on the ground floor should be encouraged. To retain the district’s fine-grained character, consolidation or mergers of more than one parcel should be prohibited. An exception to this rule should be made for mergers where a corner parcel would be consolidated with one adjacent parcel. These mergers would allow slightly larger structures to be developed on corners, which would allow more housing units to be developed with access to parking from the side street. Redevelop the parcels in the Phelan Loop Area with new mixed-use development. Although the Phelan Loop Area is functionally a part of the Ocean Avenue Neighborhood Commercial District, it has a distinctly different character from the rest of the commercial district. This area breaks the traditional urban pattern of buildings built to the sidewalk. The reconfiguration of the existing Phelan Loop would encourage the development of housing sites. The first site, currently known as the Kragen Site because it is occupied by a Kragen Auto Parts store, is the largest individual site in the Phelan Loop area. New development here would contribute substantially to the revitalization of this area by introducing new housing and commercial development and would add to the creation of a cohesive streetwall along Ocean Avenue. The second site is the existing fire station/bookstore parcel. This parcel is currently occupied by a fire station and a small building housing a bookstore for City College. The relocation of the fire station is not necessary to realize the vision of this area however, if the station should relocate, a residential/commercial mixed-use buildings could be built in its place to strengthen the connection between City College and the neighborhood, and to help activate the Phelan Plaza. The third parcel in the Phelan Loop Area would be created from the reconfiguration of the Loop itself. Reconfiguring the Phelan Loop would provide a parcel of land that aims to accommodate a 70 unit, 100% affordable housing project, bringing new residential opportunities for people with a variety of income levels to live in the neighborhood. ESTABLISH an active, mixed-use neighborhood around the transit station THAT EMPHASIZES THE DEVELOPMENT OF HOUSING. Transit station areas are often ideal places to encourage new housing growth, as new residents and other activity can be accommodated without many of the negative impacts associated with growth, notably traffic. Focusing compact growth and density around transit stops capitalizes on major investments in transit and brings potential riders and destinations closer to transit facilities, thereby increasing ridership. Encourage mixed-use housing on the Upper Yard. Development on the Upper Yard (the southwest corner of San Jose and Geneva Avenues) represents the best near-term opportunity for introducing mixed-use development into the station area. Development of this site would provide a stronger sense of neighborhood identity and bring much needed housing to the Transit Station Neighborhood. Development on the Upper Yard should seek to maximize density in order to help create increased vitality around the station and provide as much housing as possible. The massing and character of new buildings must contribute to the existing neighborhood and respect the character and scale of the Geneva Office Building. Development along Geneva Avenue should be primarily residential, with some transit and neighborhood-serving commercial uses at the street level. Development facing San Jose Avenue should be predominately residential. Encourage mixed-use housing on the northeast corner of Geneva and San Jose Avenues. A parcel at the northeast corner of Geneva and San Jose Avenues currently contains a one-story retail building and some surface parking. Immediately to the east, the city Recreation and Parks Department owns a strip of land running along Geneva Avenue as far as Delano Street, which contains open planted areas surrounded by a fence. Both of these parcels are significant in that they are underutilized pieces of land very close to the heart of the new Transit Station Neighborhood. The retail building should be appropriately redeveloped with a mixed-use building, containing housing on the upper floors and either retail or institutional space on the ground floor. The Recreation and Parks Department parcel is part of the city’s open space inventory. According to the City Charter the parcel cannot be changed to another use without voter approval unless a comparable parcel is substituted for it. If the charter requirements are satisfied, these two parcels could be combined to create the opportunity for a substantial new development. Appropriate uses would be some combination of housing, neighborhood-oriented retail, institutional space and a small amount of public open space. Housing should be developed above the Muni Green Yard. Both locally and regionally, the Muni Green Yard rail facility is an ideal location to concentrate new housing, because of its exceptional access to transit, commercial services, and other institutional assets. Additionally, the site is large – an entire block – giving it the potential to house several hundred dwelling units, greatly enhancing the activity and life at the heart of the Transit Station Neighborhood. However, even with the completion of a new inter-modal transit terminal and freeway deck, this rail yard will remain vital to Muni’s operations for many years. While it would be very complex to build over the rail facility, the potential exists to build a mid-rise, mixed-use housing development in the “air rights” above the largely single-story rail facility. In general terms, this proposal would include building a deck for new development above Muni rail operations, storage and maintenance facilities. This scenario would be expensive and complex, yet it would radically change the character of the Green Yard and the neighborhoods that surround it. The project’s greatest challenges include the creation of a viable and functional rail yard while carefully integrating new development in a manner that would contribute to the neighborhood. It is likely that a complete yard redesign and reconstruction effort would be necessary in order to realize the air rights development. A potential benefit to this reworking could be the creation of a more efficient and modern rail facility that better meets Muni’s operational needs. The development pattern atop the deck should follow the neighborhood’s traditional street grid pattern and alignments (perpendicular to San Jose Avenue), essentially creating a grouping of elevated city blocks, rather than a single, massive super-block. Efforts should be made to align egress points with existing streets and the traditional street grid pattern along San Jose Avenue. To the extent practical, enough space should be available between Muni operations and the sidewalk to build new housing units along the Green Yard’s street-facing edges. Attention should be focused on scale and the creation of an active and interesting street level presence. 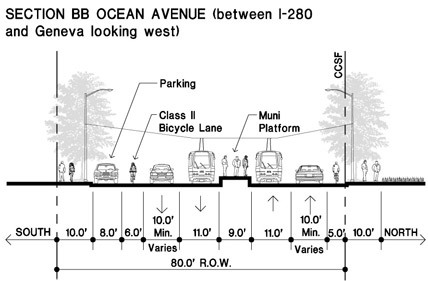 Low to mid-rise (up to five stories) residential units such as stacked flats and/or town homes should be built on the street level along Ocean and San Jose Avenues. These units would separate the otherwise blank walls associated with the rail yard and the street. The units built along San Jose Avenue should follow a 25-foot wide pattern of vertical modules to respect the scale and character of the homes across the street. In both cases, particular emphasis must be placed on creating buildings with human scale that do not appear monolithic or unusually wide and massive. The buildings should follow the urban design principles and guidelines set forth in this Plan. More intensive mid- to high-rise development should be built atop the deck, with density and height increasing in closer proximity to the multi-modal station. Any tall buildings built within the new blocks should be graceful and slender. Consider housing as a primary component to any development on the reservoir. The Balboa Reservoir represents one of the largest remaining undeveloped sites in San Francisco and currently forms an unpleasant void in the neighborhood. Developing housing on this site would help fill this void in two ways. First, housing here would add more people to the area; enlivening the commercial district and increasing ridership levels on the nearby public transportation services. Second, new housing development would fill the void between the commercial district and the surrounding neighborhoods, enticing residents to walk to the commercial district and use alternative modes of transportation. Develop housing on the West basin if it is not needed for water storage. If the PUC should decide that the west basin is not needed for water storage, it should consider development of a mixed-use residential neighborhood on part of the site to address the city-wide demand for housing. Affordable hsouing should be considered a high priority per Policy 4.5.1. PROVIDE INCREASED HOUSING OPPORTUNITIES AFFORDABLE TO A MIX OF HOUSEHOLDS AT VARYING INCOME LEVELS. In addition to preserving and increasing the supply of housing in the area, there is much that can be done to make housing more affordable in the area. Innovative means of increasing affordability have been explored as part of the community planning process. This plan supports the creative application of all means to enhance the amount and diversity of affordable housing in the area. Give first consideration to the development of affordable housing on publicly-owned sites. Development of a wide variety of housing stock, containing units of various sizes, styles and prices, will help ensure that the plan area’s current diversity in income, ethnicity, family size, and lifestyle can be maintained. Where publicly-owned parcels are being developed, the city should require that this diversity be included as part of new development. In addition, city policy directs that surplus public property be considered for development of affordable housing. Thus, when offering their land for development, first consideration should be given by these agencies to the development of housing affordable to individuals or families making less than 120 percent of the area median income. Establish programs to increase affordability of housing developed in the Plan Area. The Bay Area is one of the pilot locations for the Location Efficient Mortgage Program. This program recognizes the lower costs of transportation for households living in neighborhoods near good transit service and allows these households to qualify for higher mortgage amounts based on these lower transportation costs. The plan area should be included in the eligibility zone for this new program. The plan area has approximately 2,755 housing units, providing homes to more than 6,340 people. In contrast to new housing, existing housing tends to be more affordable. The area’s existing housing stock should be preserved and remain available for occupancy by a wide range of residents. Maintain a presumption against the loss of existing housing units. As housing demand increases, developers or property owners may seek to demolish or renovate housing that currently serves lower-income households in favor of housing for higher-income households. With the exception of substandard units, the existing housing stock should be protected, especially those units serving lower-income households. Development proposals that would result in a net decrease in the number of housing units should be rejected. Development proposals which would result in a net addition to the number of housing units in the area should be considered on a case-by-case basis. Dwelling-unit mergers reduce the number of housing units available in an area. If widespread, over time, dwelling unit mergers can drastically reduce the available housing opportunities, especially for single and low-income residents. This plan maintains a strong prejudice again dwelling unit mergers. Assist lower-income homeowners in making improvements to their houses. The availability of low-interest loans can help homeowners with limited resources to make structural or aesthetic improvements to their properties. These funds allow lower-income households to improve their homes and remain in their community rather than live in unsatisfactory conditions or relocated to other communities where affordable and adequate housing can be found. PROMOTE HEALTH THROUGH RESIDENTIAL DEVELOPMENT DESIGN AND LOCATION. Well planned neighborhoods – those with adequate and good quality housing; access to public transit, schools, and parks; safe routes for pedestrians and bicyclists; employment for residents; and unpolluted air, soil, and water – are healthy neighborhoods. Healthy neighborhoods provide quality living environments that have been demonstrated to have an impact on respiratory and cardiovascular health, reduce incidents of injuries, improve physical fitness, and improve social capital, by creating healthy social networks and support systems. Housing in the plan area should be designed to meet high standards for public health and the environment. New development should meet minimum levels of “green” construction. The concept of Green Building “encompasses the ways of designing, constructing and maintaining buildings to decrease energy and water usage costs, improve the efficiency and longevity of building systems, and decrease the burdens that buildings impose on the environment and public health.3 Green building can improve the health of our residents and our environment and is required by the Planning Code when constructing new housing in the plan area. Public parks, plazas and open space areas are critical neighborhood-enhancing and -defining elements. In a successful urban neighborhood, these spaces will complement and enhance the open space provided by public streets. Well-located parks and plazas can knit together surrounding urban areas by providing a variety of active and passive recreational activities and informal gathering places. A successful open space system enlivens and supports the neighborhood by including a variety of convenient, accessible and attractive public spaces serving different purposes and a mix of users. There are a handful of open spaces in the plan area. The largest and most notable of these is Balboa Park, a green that includes baseball diamonds, soccer fields, a swimming pool, and multi-purpose grass areas. Although San Jose and Ocean Avenues front this prominent park, it is largely screened from view by dense vegetation and fencing. Physical and visual linkages to Balboa Park from the surrounding neighborhoods should be improved. In addition, smaller neighborhood and transit-oriented parks and plazas should be introduced in the Transit Station Neighborhood and the Phelan Loop Area. This Plan aims to create a system of neighborhood open spaces, including active, passive, and informal gathering areas. These spaces should be easily accessible and located throughout the plan area in order to best serve the surrounding neighborhoods and the transit users’ needs. The space between new and existing buildings and sidewalks in the Transit Station Neighborhood and the Phelan Loop Area will shape the character of formal urban open spaces. Balboa Park and a new open space developed over the western portion of the Balboa Reservoir will define the larger parks. The combination of landscaped streets, parks and public gathering areas would offer variety and form an interesting system of urban public spaces. Streets provide important additions to the open space network and aesthetic quality of an area. The design and maintenance of all streets throughout the plan area should be guided by the Better Streets Plan, a policy document that will illustrate how planned improvements to the overall urban design quality, aesthetic character, and ecological function of the city’s streets while maintaining safe and efficient use for all modes of transportation. The Better Streets Plan will provide guidance for both public and private improvements to the streetscape. Create a system of public parks, plazas and open spaces in the plan area. Parks, plazas, and open spaces should be conveniently located and easily accessed by the community they serve. Clearly defined entrances should not only provide access into the public space, but should act as a transition area between surrounding land uses and the open space. Benches and other amenities should be provided along the edges to encourage people to move between the open space and adjoining uses. Ensuring visual penetration into parks and open space along all street-facing edges will allow people to see into these spaces from adjoining properties, increasing safety and encouraging use of the site. Fences should be transparent where they exist and are necessary for recreational purposes, such as around baseball or other sports fields, and removed wherever they are not necessary for these purposes. Create a variety of new public open spaces. A variety of active and passive recreational opportunities should be provided throughout the plan area. It important that these uses not be segmented into isolated spaces, but integrated within each defined open space and the public realm itself. The level of activity in an individual park or plaza is related to the variety of activities provided within the public space, the surrounding mix of land uses, and its ability to attract different users throughout the day. Larger, more formal parks and open space should provide activities for different age groups and levels of activity. Smaller open spaces and plazas may serve a particular function, such as a transit waiting area or sidewalk seating at a café. These smaller spaces may only provide for a single type of activity can be enlivened by the active land uses surrounding them. Benches and other seating areas should be provided within public spaces to encourage informal daily use by residents and visitors. A number of open spaces are proposed in the plan area, including the Phelan Loop Plaza, the Geneva Plaza, open space associated with the proposed freeway deck, Brighton Avenue, the Library playground, and the proposed Balboa Reservoir open space. Design Guidelines for four key open spaces are articulated below. The open space should be at an elevation generally level with and directly accessible from Ocean Avenue. The space should be designed to address the formal street front of Ocean Avenue and frame views toward the entrance to a future expansion of the City College campus. At least twenty-five percent of the open space should include vegetation/permeable material that is flush with sidewalks and other hardscape treatments. The civic open space and associated sidewalks and streets should be designed to create a comfortable and inviting pedestrian environment, while also accommodating a redesigned Muni bus loop and layover, slow auto movement, and curb parking. The street that lines the open space (not including Ocean Avenue) should be narrow, with special paving, capable of being closed by bollards for special events and during periods when there are many pedestrians. This would also work to calm traffic and reinforce the area as primarily a pedestrian zone. Benches, seats, and other amenities should be provided to encourage informal daily use. The overall space should also be flexible enough to handle special events, festivals and markets, providing adequate space for vendors and concessionaires. Since this plaza is intended for the use of passengers waiting to board transit, it should include a passenger information system, including Nextbus-style real-time arrival information. The plaza should be at an elevation directly accessible from Geneva Avenue, and must provide smooth transitions and vertical access routes. While below-grade structures (Muni operations) may be permitted below the plaza, the design should allow for large specimen trees to be planted flush within the surface of the plaza, along the perimeter, and within the space itself. Other trees may be planted in boxes that form low seat walls. The stairway and escalator entrance into the station should be redesigned, placing emphasis on good design, an inviting and well-defined street presence, and a stronger sense of civic identity. The existing enclosed BART entrance on the north side of Geneva Avenue should be replaced with an entrance that is open (similar to Market Street station entrances) with a cover overhead provided by a new glass canopy enclosure. Ultimately, this entrance should be incorporated into the design of the Geneva Avenue entrance to a new reconstructed inter-modal station as described above. A master signage program should be developed and implemented for the transit plaza and adjacent transit facilities, to provide visitors with a clear sense of location and provide direction to and between all modes of transit. Two public open spaces are possible on the freeway deck. The primary space, on the east side of the deck road, would be adjacent to the station and serve as its front plaza and formal entry. To the greatest extent possible, it should be located in the central third of the deck, but the rail terminals and platforms might push it a bit south. This public open space would help to define a sense of arrival and give a strong civic presence to the station area. A more park-like green space could be developed on the western side of the deck adjacent to Lick-Wilmerding High School and could be defined by new mixed-use buildings that harmoniously integrate the edge of the school with the new buildings so that the park’s edges are not defined by tall, monotonous, and uninterrupted concrete retaining walls. The difference in elevation between the SPUI and the school site should also be addressed during the design process. Develop a combination of active and passive recreational facilities that would serve residents of the neighborhood as well as others. Provide a well-defined eastern entrance to the open space to provide access from Phelan Avenue through the proposed new campus on the east basin of the reservoir. The entrance should provide a visual terminus for the east to west axis leading through the new development on the eastern half of the reservoir to City College’s main building atop the hill. The entrance should have a special landscaping treatment. Develop clearly marked access gates, pedestrian pathways, and visual site lines aligned with the streets of adjoining neighborhoods. Create trails, small open spaces or plazas to form useful transitions and opportunities for connection between destination points. Stairs and ramps should connect the open space atop the west basin to Ocean Avenue via an extension of Brighton Avenue. A proposed neighborhood green within the Brighton Avenue right-of-way would become the primary gateway into the park from Ocean Avenue and the neighborhoods to the south. Provide a visual buffer between the park and the houses that abut the reservoir site to the west. Pay careful attention to the design of edges between the open space and surrounding neighborhoods as well as Riordon High School. It is important to provide access into the park from the surrounding neighborhoods while respecting the privacy of adjacent homes. Trees and shrubs should be planted to provide a buffer between the houses that abut the reservoir site to the west. Entrances to the park should align with existing streets for direct pedestrian access and to extend clear views into the park from public streets. Safe and active open spaces should be designed, including a re-design of Balboa Park. Balboa Park should feel open and inviting to the many people traveling to and from the transit station and surrounding neighborhoods. New clearly defined entrances and greater visual access into the park will encourage use of the park for more than just prescribed recreational activities. Vegetation along the park’s street-facing edges should be trimmed and/or removed so as not to encroach upon the sidewalk or prohibit views into the park. A formal gateway should be developed on the corner of Ocean and San Jose Avenues that serves as a neighborhood landmark and emphasizes the neighborhood’s connection with the park. Art, special paving, and landscaping should be used to celebrate the entrance to the park. Benches and other seating should be provided at the entrance to allow people to enjoy watching the activities in the park as well as in the surrounding areas. More specifically, Balboa Park should feel open and inviting to the neighborhood and to the many people traveling along its borders. The Department of Recreation and Parks should undertake a new Master Plan for the park. The plan should evaluate the possibility of designing an environmentally sustainable open space, it should encourage the use of the many recreational activities that the park currently provides, and it should consider a formal gateway into the park that would serve as a neighborhood landmark and emphasizes the neighborhood’s connection with the park. The plan calls to extend streets in the plan area, enhancing the existing grid system. Extensions of the street grid for new development can serve as a means for linking open space to neighborhoods. The creation of a path to the open space parcel on the reservoir should be explored when extending Brighton Avenue. 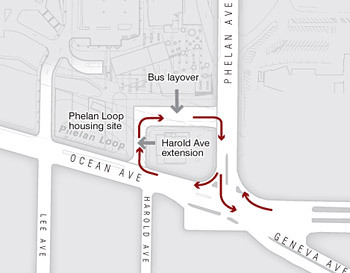 The Lee Avenue extension should link the street with the proposed Phelan Loop plaza. Pay attention to transit waiting areas. Important transit nodes in the plan area should be celebrated and designed with a strong sense of civic identity. Waiting areas should offer protection from the elements and be large enough to accommodate the intended users. Transit waiting plazas, and the sidewalks and streets that line them, must be designed to accommodate a high volume of pedestrian movement. Use “found space” as public open space. A number of opportunities exist in the plan area to create small but important public places out of unused space within the public realm. The land around irregular intersections, widened sidewalks, and utility easements can be transformed into valuable community space through the installation of benches and other amenities that will create inviting public places. Widened sidewalks can be used for café seating and other retail-oriented gathering spaces. Otherwise unused spaces could be redesigned as places for people. The plan proposes to re-design the area’s main streets with wider sidewalks, places to sit, landscaping and street trees. To foster a sense of place and to improve the pedestrian experience, significant public space improvements – such as bulb-outs and landscaping treatments – will be focused where side streets intersect with the main streets of Phelan, Ocean, Geneva, and San Jose Avenues. As more people live in the neighborhood, greater pressure is placed on existing open spaces. Major new developments in the plan area should assist in meeting the demand that they create for open space. These developments should be required to provide publicly accessible open space in a quantity directly proportional to the size of the development or to the lot size, whichever is greater. San Francisco’s climate is such that sunny, wind-protected outdoor sites are the most usable on most days of the year. Outdoor spaces should be oriented in relation to adjacent development so that there will be direct sunlight during periods of high usage. Prevailing wind patterns and local wind currents created by adjacent development should also be considered. Barriers to deflect unpleasant winds should be used where appropriate. Achieving an engaging public realm for the Balboa Park plan area is essential. Developing the transit station area will create identifiable landmarks in the urban landscape. Improving the appearance of building facades along the Ocean Avenue commercial district will make the area more inviting. Improve the visual and physical character of the Ocean Avenue Neighborhood Commercial District. By improving the appearance of building facades and creating pedestrian-friendly sidewalks, the area will become a more inviting, desirable, and vital center of commercial activity. It will grow as a corridor that both reflects the culture of its residents and invites exploration by visitors. Redesign the main streets -- Phelan, Ocean, Geneva, and San Jose Avenues -- to encourage walking and biking to and from the Transit Station Neighborhood, City College, and the Ocean Avenue Neighborhood Commercial District. The main streets in the plan area are poorly designed; they promote the fast movement of cars and contain circuitous pedestrian paths. These streets are generally cluttered; limiting mobility and creating an uninviting pedestrian experience. Improving the plan area’s connectivity from its main streets, to its neighborhood streets, and to CCSF will encourage walking and biking in the area. The streets should be re-designed to emphasize pedestrian, transit and bike movement while still accommodating auto traffic. Pedestrian routes, especially in commercial areas, should not be interrupted or disrupted by auto access and garage doors. The pedestrian interacts most with the ground story of buildings, and thus the greatest amount of attention must be paid to the articulation, transparency, and relation of building uses at this level. It is critical to ensure that pedestrian routes, especially in commercial areas, are not interrupted or disrupted by auto access and garage doors. CREATE AN SPACE SYSTEM THAT BOTH BEAUTIFIES THE NEIGHBORHOOD AND STRENGTHENS THE ENVIRONMENT. Open space not only provides places to recreate and relax, but also helps improve the environmental quality of the neighborhood. Ecological sustainability is a key goal in the development of public spaces. New public open spaces should incorporate ecological sustainability elements, such as bioswales and natural areas. Urban areas such as San Francisco can improve existing water quality of our bay and ocean by encouraging more on-site infiltration. Pervious surfaces, such as parking lots, are one of the main causes of pollution flowing directly into these water resources, and one of the easiest sources to make more permeable. Permeability allows the water to be filtered through the soil before reaching the bay or the ocean. An ongoing master planning process being conducted by the San Francisco’s Public Utility Commission (PUC) will provide guidance on how best to mitigate stormwater flow in the city’s sewers, for example, by designing surface parking and loading areas to infiltrate rainwater onsite, rather than sending it into the drain. Make the open space system more environmentally sustainable by improving the ecological functioning of all open spaces in the plan area. Encourage efforts to uncover and restore Islais Creek to its natural state. Water is ubiquitous yet invisible in the Balboa Park area. The south branch of Islais Creek runs through the area. And while culverted, Cayuga Avenue residents can still hear the creek water. In rainy seasons the creek floods. Where possible, this water source should be uncovered to expose another unique attribute of the area. 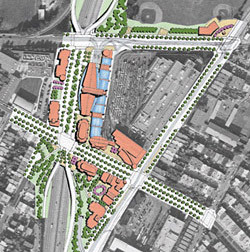 The Balboa Park Station Area Plan was in part chosen as a pilot project for the Better Neighborhoods program because the area contained the urban services and amenities that make a great neighborhood; it simply lacked a “sense of place.” Urban design is the process of giving physical design direction to urban growth, conservation, and change. Urban design draws together many strands of place-making into the creation of places of beauty and distinct identity. Urban design is about creating a vision for an area and then deploying the skills and resources to realize that vision.4 The Balboa Park Station Area Plan has a vision to create a ‘sense of place.’ By focusing on connections (both physical and visual), the public realm, design, and the creation of a new neighborhood, this chapter focuses on how urban design can help achieve the plan’s vision. A main goal for the plan is to provide connections between the Ocean Avenue Neighborhood Commercial District, City College, and the Transit Station Neighborhood. The street grid represents the basic unifying system for the neighborhood. The area has a good urban street pattern characterized by small, walkable blocks. The plan encourages this traditional street pattern as a way to improve connections within the plan area. The plan area contains isolated sections either caused by underutilized land or the intrusion of major infrastructure. This plan encourages infill development to connect these isolated sections. The distinctive and attractive qualities of an area derive in great part from the design of individual buildings and the way in which these buildings come together to form the public realm. Achieving an engaging public realm for the Balboa Park plan area is essential. The combination of poorly designed streets and a lack of public and private investment in the area has contributed to the decline in the public realm. Re-designing the main streets and encouraging infill development will enhance the public realm by providing visual interest and adding activity to the street. Developing the transit station area, and improving the appearance of building facades along the Ocean Avenue commercial district will also help to improve the public realm. This section of the plan addresses the scale, character, and relationships that new buildings should embody in strengthening the public realm. The transit station area is characterized by the Balboa Park Bart station, the Geneva Office building, surface parking lots, and the Muni rail facility. The area is not inviting, nor does it provide any services that complement the existing transportation services. This plan proposes the development of a transit village, and increases heights in this area to accommodate the goals of this development. It also proposes new height and bulk limits that allow for a greater variety in scale and character, while maximizing efficient building forms and enabling gracious ground floors. Developing the Transit Station Neighborhood into a new transit village will create identifiable landmarks in the urban landscape through the siting and massing of significant buildings. There are fundamental patterns of building composition that are essential to creating a pleasing public realm and establishing a human-scaled neighborhood character. Comprehensive urban design guidelines for the Balboa Park plan area will ensure that new development respects and builds upon the existing character while meeting these fundamental patterns. Create strong physical and visual links between the Transit Station Neighborhood, City College, and the Ocean Avenue Neighborhood Commercial District. San Francisco has a history of creating visual corridors through the city, visually, and physically connecting its different areas together. One of the plan’s main goals is to create strong physical and visual links by improving accessibility to the Transit Station Neighborhood, City College, and the Ocean Avenue Neighborhood Commercial District. Large parcels should emphasize the existing street pattern, by extending Harold, Brighton, and Lee avenues south across Ocean Avenue. Extending and building upon the existing street pattern will help to connect the disparate sections of the area plan by breaking up large parcels of land into walkable blocks. In areas where the street cannot be extended due to topography or other factors, the “line of the grid” should continue in the form of a public pathway. Establish an east/west pedestrian pathway connection to link the BART Station to the Ocean Avenue Neighborhood Commercial District and City College. New City College facilities should be designed on an extension of the existing street grid. New buildings should have a strong street presence and be built to the public right of way, creating a cohesive streetwall along Phelan Avenue, internal roadways and pedestrian pathways. City College should include pedestrian improvements that help link the students with the retail services provided on Ocean Avenue and with the area’s transit services. Knit together isolated sections of the plan area with new mixed-use infill buildings. Significant gaps in activity along streets are caused by underutilized land or the intrusion of major infrastructure that can make even very close areas seem distant, isolated, and unconnected. Filling in these gaps with active mixed-use buildings will make the transit station and the Ocean Avenue commercial district feel physically and psychologically connected. By knitting together these areas with infill development, residents and visitors alike will be encouraged to walk the area and take advantage of the shopping, cultural, and transportation resources that have seemed separated by voids. DEVELOP THE TRANSIT STATION NEIGHBORHOOD TO EMPHASIZE ITS IMPORTANCE AS A TRANSIT HUB AND LOCAL LANDMARK. Developing the transit station area as a new mixed-use neighborhood will create a landmark in the urban landscape through the siting and massing of significant buildings. A new transit centre would include a freeway deck over the I-280 freeway between Ocean and Geneva Avenues. It would also include a new transit station, integrating the Balboa Park Bart station and the Muni facilities. Housing is proposed to surround the transit center, and building heights and development densities at the transit station should be increased to take advantage of the transit infrastructure. 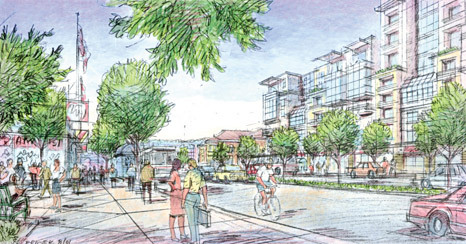 The Upper Yard, at the southwest corner of San Jose and Geneva Avenues, represents the best near-term opportunity for introducing mixed-use development into the station area. Development on this site would provide a stronger sense of neighborhood identity and bring much needed housing to the Transit Station Neighborhood. Create a deck over the I-280 between Ocean and Geneva Avenues to integrate the Transit Station Neighborhood with City College and the Ocean Avenue Neighborhood Commercial District. The design of the proposed freeway deck should refer to the following guidelines. A primary advantage of the freeway deck is that it would provide space to serve multiple modes of transportation, including buses, streetcars, pedestrians, bicycles, and automobiles, that need to access the station. The deck should be designed and organized in a manner that effectively accommodates each of these modes while remaining a friendly place for pedestrians. The road on the deck and the SPUI ramps should be as narrow as possible to keep traffic calm and allow for easy pedestrian crossings, while they provide for the safe movement of autos, bicycles and buses. Sidewalks should be wide enough to accommodate the thousands of transit users who will walk through the area daily. Bus stops and passenger drop-off areas should be clearly defined and designed to function within a busy environment, and should provide direct connections into the multi-modal station. The area on the deck immediately adjacent to the station would likely incorporate new stub rail terminals for the K streetcar line and be incorporated into an expanded inter-modal station as described above. Additionally, there would be room on the deck to accommodate a stub terminal for a future light-rail line on Geneva Avenue. The deck would create a new “piece of land” over Interstate 280, available for development, open space, and community-supporting services. Development opportunities on top of the deck should be explored to the greatest extent practical: new buildings here would be essential in creating human-scaled development rather than a large, auto-dominated overpass. Two building opportunities would exist on the deck: adjacent to Lick-Wilmerding High School on the west side of the deck, and adjacent to the BART station on the east side. New development adjacent to Lick-Wilmerding High School should include mixed-use residential buildings. These uses will help activate the area, provide housing opportunities, and strengthen the area’s character. 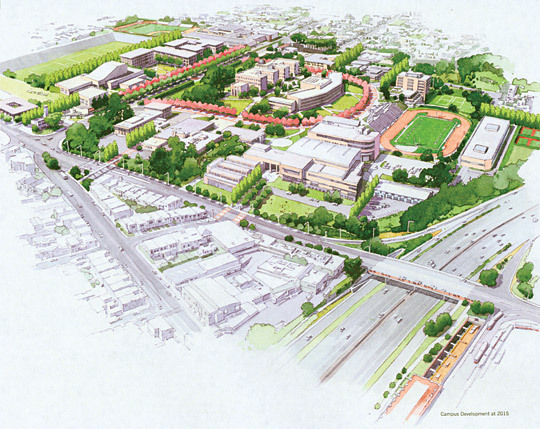 The buildings should be adjacent to Ocean and Geneva Avenues, and possibly separated by a central open space, sited so as to complement development at Lick-Wilmerding High School. Streetcar tracks and passenger platforms would likely take up most of the ground floor of a transit center on the east side of the deck. Housing could be built above these facilities. Any buildings should be integrated with the station building to the greatest extent possible. Their placement and form should strengthen the character of the station and help to define pedestrian access routes and entries. There should be transit-oriented retail activities such as cafes, newsstands, personal services, and dry cleaners on the ground floors, and upper story offices and housing. The Balboa Park BART Station should be reconstructed to reinforce its role as a regional and local transit node and important neighborhood landmark. The Balboa Park Bart station should be reconstructed to improve internal circulation, incorporate terminals for Muni Metro streetcars within the facility, and to create a strong and inviting public presence and memorable identity. The reconstruction of the station should refer to the following guidelines. The new station should contribute to the neighborhood by having a strong street presence. Particular emphasis should be placed upon creating distinctive pedestrian entrances on Ocean and Geneva Avenues. Entrances should be well-defined and inviting, and should establish a strong sense of civic identity. These primary entrances should be celebrated in different ways, with each reflecting its unique orientation and context, but designed to fit into the station context. The station entrance facing Geneva Avenue should embody the characteristics of a traditional neighborhood train station, possibly including a grand entrance lobby defined by a strong central space of greater height, and special roof treatment. This, or similar architectural statements, should establish the station’s role as a civic anchor, linking neighborhoods on both sides of Interstate 280. This role will be strengthened when new mixed-uses are built on the Upper Yard, the Geneva Office Building is revitalized, and improvements are made to the adjacent Geneva Plaza, making this entry a center of activity. The context of the station entrance at Ocean Avenue is different from Geneva Avenue, but its role is quite important. It will continue to serve several thousand daily transit riders including City College students, residents of surrounding neighborhoods, and visitors to Balboa Park Station area. As such, it should serve as a landmark providing a visual beacon for pedestrians coming from either direction along Ocean Avenue. The building’s overall form should be distinctive and bold, clearly expressing its purpose and offering a strong sense of civic and neighborhood identity. It should demonstrate the highest quality architecture and use of building materials and technology. The building’s perimeter should be largely transparent, allowing the public clear views of the station and provide an additional measure of security for passengers and staff. Some portions of its external skin may be transparent, allowing natural light in by day and artificial out by night, further defining the building as a landmark and beacon. 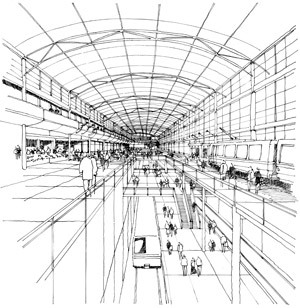 The public area within the station should be defined by a feeling of space, light and a strong sense of identity. Public areas should include unimpeded site lines to entry and access points, ticketing areas, information centers, station agents, platform access areas, seating areas, and restrooms. Transit riders should be provided with clear signage throughout the station area to ensure clarity of movement and a strong sense of orientation. Walking distances within the station should be kept to a minimum, allowing convenient access to and transfer between different transportation modes and areas outside the station. Potential conflicts between pedestrians and automobiles or rail should be clearly identified by signage, special walking surfaces consisting of textured or colored paving, special lighting, or other means. Any development on the Upper Yard site should be developed so that it contributes to the existing neighborhood and respects the character and scale of the Geneva Office building. Building Massing: In general, building heights should be greatest close to the freeway, stepping down toward San Jose Avenue to respect the scale of the surrounding neighborhoods and the Geneva Office Building. Development Pattern. A master development plan should be prepared that successfully integrates new buildings on this site with the existing entrance into the BART station and the BART mezzanine and that creates a generous sidewalk waiting area along Geneva Avenue. Buildings should be sited so as to define the block edges, address adjacent streets, and relate to the transit activities around them. Facing Geneva Avenue, the ground floor should contain retail uses. To the extent possible, these buildings should provide a public glass atrium lobby along Geneva Avenue, containing entrances to shops, places for people to wait for the bus and sit and linger out of the weather, as well as a stairway or elevator to the transit station. The street-wall along San Jose Avenue must be cohesive, while accommodating a mid-block portal for pedestrian and automobile access, as well as at least two mews-like pedestrian access points. Building(s) facing Geneva Avenue should set back to provide for a 20-footwide sidewalk, as measured from the face of curb, along the length of the block. 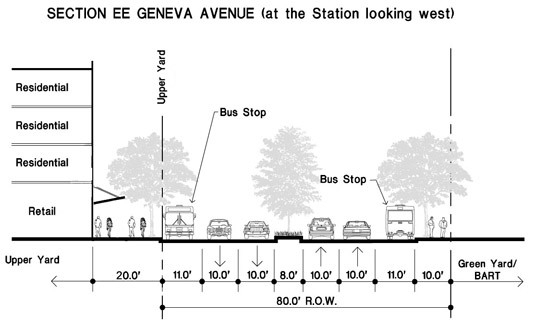 This width is required to accommodate the many transit riders who use Geneva Avenue. A public glass atrium for shoppers and transit riders may be integrated into the design of the building. Buildings facing San Jose Avenue should be set back up to 5 feet from the sidewalk in order to allow projections such as stairs, or landscaping. The intent is to allow for frequent residential entries from the street, and to create a lively and interesting street-wall. The massing of buildings facing Geneva Avenue should be lowest adjacent to San Jose Avenue, with greater massing concentrated near the transit station entrance portal and Interstate 280. Along San Jose Avenue, the mixed-use buildings should include up to four floors of residential development over one floor of ground floor retail and parking (facing the Geneva Office Building), and increase to as high as seven stories over parking where development is closest to the freeway and the BART portal. Because of the width of the Geneva Avenue frontage (approximately 180 feet) it is important that the street-facing mass be articulated in distinct masses with individual frontages no wider than 90-feet to break down the apparent size of the development. Service areas for the mixed-use building should be consolidated and accessed from San Jose Avenue, and not visible from Geneva Avenue. Service bays should be an integral element of the building and must not be visually obtrusive. Development facing San Jose Avenue should be predominantly residential, taking the form of three- to four-story buildings (flats or townhouses), while taller and larger buildings may be built along the site’s southern and western edges and adjacent to I-280. The overall form of buildings fronting San Jose Avenue should reflect either a series of tightly knit row houses, or traditional small apartment buildings. Either type should be massed with identifiable buildings with street frontages of no more than 100 feet in width, with 50-60 foot wide masses preferable. The urban design guidelines provided elsewhere in this document should also be followed. Frequent entrances to lower floor units facing San Jose Avenue are strongly encouraged to emphasize the residential use of the building, and to create an interesting and inviting street front. Ground floor residential entries may be handled several ways, including individual or shared stairs and porches or prominent entry lobbies. In any case, the location of entries should reflect a 25-foot-wide façade increment. Structured parking should be completely screened from view from both Geneva and San Jose Avenues. Any auto entrances and exits should be located on San Jose Avenue. Openings for auto access should be as narrow as possible. Any off-street parking built at or above grade on the site should obey a 25-foot setback from the property line on both the Geneva and San Jose Avenue sides, allowing for more active uses such as retail or residential entrances to front the street. Parking developed one-half level below grade and lower would not be subject to the setback, but should be treated as an integral component of the building’s design. It should be articulated with entrances to lower floor residences and by other means so that it does not form a monotonous, uninteresting wall. If parking is placed above grade (still within a building with units above), the San Jose Avenue facades should be lined with ground-floor residences and lobbies or building entrances. All openings for ventilation must be screened with architectural details and planting. In no case should full height blank parking level walls front onto San Jose or Geneva Avenues. respect and build from the successful established patterns and traditions of building massing, articulation, and architectural character of the area and the city. There are fundamental patterns of building composition that are essential to creating a pleasing public realm and establishing a human-scaled neighborhood character. Common rhythms of building projections, window detail and proportions, exterior materials, and overall building siting are a few key ingredients that must be maintained regardless of the specific architectural fashion employed. This plan proposes new height and bulk limits that allow for a greater variety in scale and character, while maximizing efficient building forms, enabling gracious ground floors, and emphasizing key transit corridors. A comprehensive document of urban design guidelines for the Balboa Park plan area ensures that new development respects and builds upon the existing character for the area by meeting these fundamental patterns of building composition. Urban design guidelines should ensure that new development contributes to and enhances the best characteristics of the plan area. New construction is likely to happen at different scales – modest structures will fill in gaps on small parcels along Ocean Avenue, some building owners will merely upgrade their facades, and other large underutilized parcels will see dramatic redevelopment. Regardless of scale, new development should add to the district’s character, create a human scale public realm, and fit within the city’s traditional fabric; regardless of architectural style. Larger-scale development efforts must take great care to not overwhelm the scale of the area and to positively establish a pedestrian-scale pattern. Urban design guidelines have been developed for the plan area and compliance with the guidelines is mandatory. These urban design guidelines ensure that the fundamentals of good neighborhood design are followed while allowing for some freedom of architectural expression. A variety of architectural styles can achieve these important design performance standards. As such, architectural style is not regulated in this plan, but instead the Plan regulates the elements of building and site design that affect the scale, character, and pedestrian friendliness of the neighborhood. The intent is to encourage the design of buildings with a human scale that contributes to the establishment of an inviting and visually interesting neighborhood. The Urban Design Principles apply to new development in the Balboa Plan Area and are intended to supplement existing design guidelines for the area and provide recommendations for good building design. The Balboa Park Station Area Plan Urban Design Principles address two main areas of concern: (1) massing and articulation and (2) treatment of the ground floor based on the type of street a building faces. Extend the city street network wherever possible and create human-scaled blocks. The city grid pattern provides an organized and measured relationship to give sense of place, orientation, scale, and comfort. Development patterns must be respectful of the existing street grid pattern and alignments to avoid the creation of “super blocks” that would be out of scale with the rest of the neighborhood and inhospitable to pedestrians. Development on large parcels should extend existing rights-of-way onto or through the parcel or create entirely new rights-of-way, such that the resulting development consists of definable blocks with a perimeter measuring no greater than 1400 feet bounded on all sides by public rights-of-way or other means of public access (e.g. open space, pedestrian passages). Blocks must be broken by, at the least, a public pedestrian passage every 450 linear feet. Significant parcel consolidation is prohibited on Ocean Avenue to preserve the fine-grained scale of the neighborhood. No parcel consolidation will be permitted that increases the frontage width on Ocean Avenue between Manor and Delano. The neighborhood is built on a traditional fabric of lots that are narrow and deep, which provides for an enriching block face, diversity of buildings, and stimulating pedestrian experience. Exceptions may be allowed where such merger would create corner parcels, such that off street parking can be accessed from a side street. All buildings of 85 feet in height or lower must have a maximum horizontal plan dimension of 110 feet, with a maximum diagonal of 125 feet. The form of new buildings must consider the proportions and massing of other residential and street-front commercial buildings found throughout San Francisco, which are typically based on 25-foot wide building increments for row houses and neighborhood retail frontages, and that generally do not exceed 75 feet in width for larger apartment or office buildings. Efforts should be made to integrate the building into the overall scale of the streetwall. Many of the development parcels in the plan area are wider than the traditional 25-foot lot pattern, and care must be taken to create a fine-grained human scale. Individual buildings should maintain an expression of architectural unity, even for larger buildings, within the 110 foot maximum dimension. There must be a qualitatively different expression of buildings between adjacent structures. These modulation and articulation increments are based on the walking speed of the average person and the need to experience diversity in the streetfront every ten to twenty paces. Build to the edge of public rights-of-way. Buildings should embrace the public realm and the sidewalk, and set back only to accommodate elements that enhance this effect. Variations from this to accommodate wider sidewalks or front steps or stoops, create lively storefronts, or to mark entrances should be limited to the ground floor as defined elsewhere in these guidelines. Where sidewalks are less than 8 feet in width, new construction should set back to widen the sidewalk, especially along Ocean Avenue so that sidewalks are at least 8 feet in width. In the case of through-lots, concentrate massing along public rights of way and locate any open areas at the center of the lot. Parking shall be designed as an integral building element, set back at least 25 feet from street facing facades, located within or below development, completely screened from view, and wrapped by active uses on all major street frontages, notably along Ocean, San Jose and Geneva Avenues and the civic open space area on Harold Avenue. Parking should create minimal physical and visual disruption to the pedestrian environment. Above the ground floor the minimum window reveal is 2 inches. Upper floors should include smaller, vertically proportioned windows punched into walls, projections such as bay windows, or small balconies. The typical window unit should be vertical. Sliding windows or applied mullions on windows facing the street are not permitted. San Francisco’s architectural tradition and fundamentals of good place-making suggest that buildings which contribute most to the public realm have a visually satisfying proportion between a façade’s openings and its solid planes. In the best places around San Francisco, there is a balance between openings and solid planes, emphasizing pedestrian entries, windows and other points of interest, while de-emphasizing garages, storage, and mechanical areas. In addition to the larger building mass articulation based on the 25-50 foot module (outlined above), building facades which face the public realm (e.g. streets, parks, plazas) must be further articulated with a rhythm of finer incremental elements. Divisions and changes in building volumes, wall planes, and rooflines are encouraged. The use of bay windows or similar projections is encouraged, with vertical modules or breaks in façade plane from the ground floor ceiling height to the building cornice each 12-15 feet of frontage. These guidelines do not imply a requirement for bay windows. However, bay windows serve a number of important functions in the articulation of buildings. They extend a building’s private domain into the public realm, making for richer and more engaging interactions of buildings and streets and maximizing the opportunity for “eyes on the street.” Other ways of achieving such building articulation and a flow between the interior of buildings and the public realm—outside of a strict requirement for bay windows—may also exist, but any alternative architectural solution must achieve these benefits to the public realm. Special building elements and architectural expressions such as towers, special entries, or cupolas should be used strategically at key locations, including street intersections and near important public spaces. They contribute to a building’s distinction as a landmark, help to define a gateway, draw attention to an important activity, or help define public gathering places. These elements must be integrated into the design of the building. Special corner treatments are encouraged for buildings that front onto the intersections of Harold and Ocean Avenues, Phelan and Ocean Avenues, San Jose and Geneva Avenues, and at the primary entrances of the transit station facing Geneva and Ocean Avenues. Buildings must include a clearly defined base, middle, and roof or cornice termination. The middle of buildings should be clearly distinguished from the base and be articulated with windows, projections, porches, and balconies. Above five stories, the top floor(s) should be incorporated into an appropriately scaled expression of the building’s top. Cornices are not required. However, when designed well, cornices serve a number of important functions in relating a building to the public realm. They terminate the façade against the sky and create a definition that establishes the public street environment as an “urban room.” They are an integral part of the façade composition, adding balance and helping tie the upper portions of a building to its base. Other ways of achieving these gestures to the public realm—other than strict inclusion of a cornice—are possible, but any alternative architectural expression of a façade must achieve these benefits to the public realm. The minimum recommended horizontal projection is 2 feet, with 3 feet preferable for buildings up to five stories. The roof, cornice, and/or parapet area should be well integrated with the building’s overall composition, be visually distinctive, and should include elements that create skyline interest. Roof forms should be drawn from the best examples in the area. Upper floor setbacks or other architectural techniques should be considered for structures taller than four stories in order to relate to the scale of nearby buildings and establish a sense of street enclosure that avoids abrupt changes in height. Building facades should include three-dimensional detailing such as bay windows (discussed above), cornices, belt courses, window moldings, and reveals to create shadows and add interest. Other elements that may contribute include awnings, canopies, projections, trellises, or detailed parapets. Windows and cornices are especially important elements contributing to the creation of a comfortable “urban room” and pedestrian environment. High quality building materials should be used on all visible facades and could include stone, masonry, ceramic tile, wood, pre-cast concrete, and high-grade traditional “hard coat” stucco (as opposed to “synthetic stucco” that uses foam). Rich detailing is encouraged to provide interest and create variation in wall planes. Materials and level of detail should be drawn from the best examples in the area. Base and cornice materials should be balanced in material and/or color. The design and use of a building’s ground floor has the most direct influence on the pedestrian experience along the street. Ground floor uses in the area are devoted to retail, service, and public uses and to residential units, lobbies and storage in apartment buildings. These uses provide an active and visually interesting edge to the public life of the street, which is especially critical on neighborhood commercial streets. Ground floors should be visually distinguishable from upper floors, with generous ceiling heights. The base or ground floor of all buildings should contain active ground floor uses and avoid blank, unarticulated wall planes. The ground floor should be composed of a clearly legible framework of structural bays, flexible enough to offer the potential for varied and interesting street-front shops, restaurants, or lobbies for residences. Storefronts should include large windows, clearly defined entries, and attractive pedestrian-level detailing and ornamentation. Surface parking lots are prohibited between the sidewalk and the front of buildings. For parcels with greater than 25 feet of street frontage, parking is not permitted within 25 feet of the sidewalk. This space should be supportive of residential or commercial uses. For corner lots, one street face, preferrably that which is not on a commercial or transit street, is excluded from this requirement, provided that parking is fully screened and not visible from the sidewalk. For residential-only buildings, parking submerged at least 5 feet below grade need not be set back from the sidewalk, provided that the parking is fully screened and not visible from the sidewalk. No more than 30 percent of the width of the ground floor may be devoted to garage entries or blank walls (except where curb cuts are expressly prohibited by this plan, such as on Ocean Avenue). No façade may feature garage entries that together total greater than 16 feet in width. Large garage entries are extremely detrimental to the pedestrian character and safety of a street and vehicle traffic crossing the sidewalk should be contained to the absolute minimum necessary to facilitate access. Eight foot wide garage entries are preferable for narrower parcels (less than 50 feet wide). For larger parcels (greater than 50’ street frontage) a single 10’ garage entry and exit is preferable. Where separate paths for entrance and exit are deemed necessary for access, in no case should a combined ingress/egress opening exceed 16’ in width. At least 70 percent of the width of the ground floor must be devoted to windows, entrances to dwelling units, store windows and entrances, landscaping or planters, and other architectural features that provide visual relief and interest for the street frontage. Building entries and shop fronts should add to the character of the street by being clearly identifiable and inviting. Blank walls (absent windows, entries, or ornamentation). Display windows with unobstructed views into interior spaces and building entrances should line major streets. Service functions such as trash, utility or fire rooms, should not be placed at the streetfront if possible. Primary building entries are encouraged to be set back, though no more than 5 feet from the street-facing façade; and should be no wider than 15 feet at the facade per individual entry. A recessed entryway provides transition space between the public sidewalk and the private interior of the building and creates a welcoming portal to the public realm. Use changes in projections and recesses, along with materials and color to emphasize pedestrian entries and architectural features, and to de-emphasize garage doors and parking. These elements help to focus attention on the active spaces of a building and reinforce a human scale within the façade. First floor residential units are encouraged to be at least 3 feet above sidewalk level such that the window sill of these units is above pedestrian eye level in order to maintain the units’ privacy. Lower level (1-3 story) residential units should be directly and independently accessible from the sidewalk, rather than from common lobbies. In all cases, ground floor uses should be directly accessible from the sidewalk at sidewalk grade with no steps up or down. To have a strong relationship with the pedestrian realm, storefronts and residential entries should be accessed directly from and related to the sidewalk. Ground floor frontages must be no less than 60% fenestrated and 75% transparent. For improved pedestrian experience, dark or mirrored glass should be discouraged. Treat solar consideration architecturally, through the use of recesses, eyebrows or awnings. Ground floors should have at least 12’ clear ceiling heights. Successful retail spaces have an uncramped atmosphere with high ceilings. They often have clerestory windows. If provided, off-street parking must be accessed via side streets or alleys. No curb cuts are permitted on Ocean Avenue between San Jose Avenue and Manor Drive. It is critical to maintain continuous storefronts and an active pedestrian environment uninterrupted by cross-traffic accessing off-street parking or dead spaces created by garage doors. If provided, off-street parking must be setback at least 25’ from street-facing property line, including parking above the ground floor. Parking is not permitted as a use along commercial streets, in favor of active uses that contribute to the life of the street. Horizontal articulation is required between the ground floor and second story. A minimum 6 inch projection is suggested. The human scale of the sidewalk is of paramount importance on neighborhood commercial streets. Architectural detailing, such as a belt course or cornice, at the ground floor ceiling height helps to frame the pedestrian space of the sidewalk. New buildings should epitomize the best in contemporary architecture, but should do so with full awareness of the older buildings that surround them. Infill development should always strive to be the best design of the times, but should do so by acknowledging and respecting the positive attributes of the older buildings around it. The new should provide positive additions to the best of the old, and not merely replicate the older architecture styles. Ground floor retail uses should be tall, roomy and as permeable as possible. Height and bulk controls should maximize opportunities for housing development while ensuring that new development is appropriately scaled for the neighborhood. A primary intent of height districts is to provide greater variety in scale and character while maximizing efficient building forms and enabling gracious ground floors. In general, existing height limits throughout the surrounding neighborhoods and most of the Ocean Avenue commercial district remain unchanged, and heights increase toward the transit station area. Development immediately around the station, on San Jose, Geneva and Ocean Avenues, should be somewhat taller than the surrounding neighborhoods to mark the station’s importance as a landmark, to provide opportunities for more housing in the most advantageous location in the plan area for housing, and to help bring more activity and energy to the transit station neighborhood. Height limits step down in order to reflect adjacent contextual conditions. Heights should reflect the importance of key streets in the city’s overall urban pattern, while respecting the lower scale development that surrounds the plan area. Generally, the prevailing height of buildings is set to relate to street widths throughout the plan area. Height should emphasize key transit corridors and important activity centers. PROMOTE THE ENVIRONMENTAL SUSTAINABILITY, ECOLOGICAL FUNCTION AND THE OVERALL QUALITY OF THE NATURAL ENVIRONMENT IN THE PLAN AREA. buildings can better integrate themselves with the natural systems of the landscape. These efforts have the immediate accessory benefits of improving the overall aesthetic character of neighborhoods by encouraging greening and usable public spaces and reducing exposure to environmental pollutants. The connection between building form and ecological sustainability should be enhanced by promoting use of renewable energy, energy-efficient building envelopes, passive heating and cooling, and sustainable materials. Sustainability addresses topics including energy, hazardous materials, water, human health, parks, open spaces, streetscapes, transportation and building methodologies and technologies. Promote resource conservation and rehabilitation of the built environment, using an environmentally sensitive “green building standards” approach to development. New buildings should comply with strict environmental efficiency standards. The positive relationship between building sustainability, urban form, and the public realm has become increasingly understood as these buildings become more commonplace in cities around the world. Instead of turning inwards and creating a distinct and disconnected internal environment, sustainable buildings look outward at their surrounds as they allow in natural light and air. In so doing, they relate to the public domain through architectural creativity and visual interest, as open, visible windows provide a communicative interchange between those inside and outside the building. In an area where creative solutions to open space, public amenity, and visual interest are of special need, sustainable building strategies that enhance the public realm and enhance ecological sustainability are to be encouraged. The heritage of San Francisco is preserved in its historically significant buildings, sites, and districts. These historic resources are important to the quality of life in the city and attract residents, visitors, and businesses alike. Historic resources provide continuity to the events, places, people, and architectural style of the city’s storied past and their protection, rehabilitation, and reuse ensure that they remain present for future generations. The Balboa Park plan area contains an assortment of historic resources. The Ocean Avenue Neighborhood commercial district contains many commercial buildings dating roughly between the 1920’s to the 1940’s. This era coincides with increased development in the area brought about by public transportation corridors and the increasing population of San Francisco. Balboa Park itself is a landscaped parcel containing open space and properties constructed prior to 1955 such as the community swimming pool building. The historic preservation objectives and policies of the Plan provide for the retention and reuse of the area’s historic properties. The Plan regulates sound treatment of historic resources according to established standards, it encourages the rehabilitation of resources for new compatible uses, and it allows for incentives for qualifying historic projects. PROTECT, PRESERVE, AND REUSE HISTORIC RESOURCES WITHIN THE BALBOA PARK STATION PLAN AREA. Significant historic and cultural resources located in the plan area include individual properties that are listed on or eligible for the National or California Register, or that are designated as Landmarks under Article 10 of the Planning Code. These historic and cultural resources cannot be replaced if lost to demolition or altered in such manner their historic significance is diminished. To retain this significance, these resources should be protected, preserved, and reused. The Secretary of the Interior’s "Standards and Guidelines for the Treatment of Historic Properties" should be applied in conjunction with the overall neighborhood plan and objectives for all projects involving historic resources. The Secretary of the Interior’s Standards and Guidelines for the Treatment of Historic Properties (Standards) provide guidelines on how to manage any change to a historic resource and appropriately address historical materials, features, and character. In conjunction with the overall plan and objectives, the Standards shall be used to ensure that alterations to historic resources within the plan area are designed to minimize the removal of historic fabric and the overall impact upon the resource and enhance neighborhood character. The rehabilitation and adaptive reuse of historic buildings in the Balboa Park Station plan area should be promoted. Many cultural and historic resources no longer retain their historic use. In such cases, it is desirable to adapt historic resources to suit compatible new uses while preserving character-defining features. The Planning Department shall support rehabilitation and the adaptive reuse of historic buildings within the Balboa Park Station plan area pursuant to the Secretary of the Interior’s Standards. Individually significant resources in the Balboa Park Station plan area should be protected from demolition or adverse alteration. Significant historic properties cannot be replaced if lost to demolition or altered in such manner that their historic significance is diminished. To protect the character and quality of historic resources, the Planning Department shall scrutinize all proposals to demolish or significantly alter any historic resource within the Balboa Park Station plan area. Archeological resources found in the plan area should be preserved in-place or through appropriate treatment. The Balboa Park Station Plan area is sensitive for several types of archeological resources: prehistoric occupation and small ephemeral activity sites; remains of the House of Refuge (San Francisco Industrial School, 1859-91); 19th century dairies and farms, including clusters of French Swiss dairy farms; remains of Ingleside Race Track and Ingleside Coursing Park; and Ocean Avenue saloons, and clubrooms. Preservation of significant archaeological sites requires sufficient identification and inventorying of documented and potential archeological resources. As a non-renewable resource, preservation in-place is the preferred treatment of an archeological site. Where preservation of an in-situ archeological resource is not possible, appropriate preservation treatment of the resource should be assured through data recovery, analysis, documentation, recordation, curation and public dissemination of the significance of the resource through interpretive products. Historic resources that are less than fifty years old should be protected. A challenge of recognizing cultural and historic resources that are less than fifty years old is to understand what treatments are appropriate for those properties. Modern materials, styles, and property types are not as widely appreciated or studied as older materials and styles. Any building, object, or landscape less than fifty years of age within the Balboa Park Station Plan Area that displays exceptional significance for designation at a local, state, or national level shall be reviewed as historic resource. INTEGRATE HISTORIC PRESERVATION WITH THE LAND-USE PLANNING PROCESS FOR THE BALBOA PARK STATION PLAN AREA. It is important that throughout the planning process, the Planning Department work with various city agencies to ensure the protection and preservation of historic resources. Revised policies, guidelines, and standards should be adopted as needed to further preservation objectives. New information regarding historic resources is discovered on a regular basis. As new information is compiled, it shall be utilized to update and revise the policies set for the Balboa Park Station plan area as needed to further preservation objectives of the plan. All projects located within the Ocean Avenue Potential Historic District should follow the Balboa Park Design Guidelines for the Potential Ocean Avenue Historic District. The destruction of historic resources from owner neglect or inappropriate actions should be prevented. Owners of all properties have a responsibility to maintain their investment in good condition and to obtain City approval for alterations. The Planning Department shall seek remedies in cases of neglect or impairment through owner action/inaction within the Balboa Park Station plan area, particularly those that affect a cultural or historic resource. An emergency preparedness and response plan should be developed that considers the Balboa Park Station plan area’s historic resources. Older buildings are among those most vulnerable to destruction or heavy damage from events such as earthquake or fire, resulting in potential danger to life safety as well as an irreplaceable loss of the historic fabric of San Francisco. The Planning Department shall ensure the future welfare of resources by developing plans and working with other agencies for preparation and response to earthquakes, fires, and other disasters. FOSTER PUBLIC AWARENESS AND APPRECIATION OF HISTORIC RESOURCES WITHIN THE BALBOA PARK STATION PLAN AREA. The public can play an important role in identifying historic resources by participating in surveys and context statement development or by submitting Potential San Francisco Landmark Evaluation forms to begin a formal designation process. Such participation can help to promote greater civic pride and awareness of the historic and cultural landscape of the plan area. Formal designation of the Balboa Park Station’s historic resources should be supported, as appropriate. The Planning Department shall support official designation of resources at local, state, and national levels. Public participation in the identification of cultural and historic resources within the Balboa Park Station plan area should be encouraged. San Francisco residents, merchants, and local historians may possess and have access to valuable historic information not widely known about buildings or other resources that would be useful in the evaluation process. The Planning Department, under the guidance of the Landmarks Preservation Advisory Board, shall seek the input and public participation in identifying historical contexts and properties in the Balboa Park Station plan area. Education and appreciation of historic resources within the Balboa Park Station plan area should be fostered among business leaders, neighborhood groups, and the general public through outreach efforts. The Planning Department shall promote civic pride and awareness of the historic resources present in the Balboa Park Station plan area through the development of outreach programs, literature, signage, and internet tools. PROVIDE PRESERVATION INCENTIVES, GUIDANCE, AND LEADERSHIP WITHIN THE BALBOA PARK STATION PLAN AREA. Preservation incentives are intended to offset the cost of preservation and encourage property owners to maintain, repair, restore, or rehabilitate historic and cultural resources. The availability of financial incentives for qualifying historic preservation projects should be promoted. A number of financial incentives are available to owners of historic resources to assist in preservation. Preservation incentives are intended to off-set the cost of preservation and encourage property owners to maintain, repair, restore, or rehabilitate historic resources. The Planning Department shall promote and support the use of preservation incentives and shall provide information to the public on available preservation incentives to increase participation and awareness. The use of the State Historic Building Code for qualifying historic preservation projects should be encouraged. The State Historic Building Code (SHBC) permits alternate design approaches to the regular Building Code that can minimize adverse impacts while still providing for health and safety. The Planning Department shall encourage and facilitate use of the SHBC for historic properties. Streets and open space are the shared public space of the city, the site of celebrations and demonstrations; they are the place where the stories and histories of many divergent communities coincide. Art can serve as a mirror and a conduit for these various meanings; it can take on numerous forms in the life of public space. An Ocean Avenue/Balboa Park Area Arts Master Plan was created by artist Ann Chamberlain and the San Francisco Arts Commission’s Public Art Program in response to a request from members of the community that the Arts Commission work with the Planning Department to develop an arts master plan in conjunction with the larger Balboa Park Station Area Plan. To identify additional funding opportunities and strategies for implementation of these projects. This plan incorporates some of the themes and proposals contained in the Arts Master Plan, which is published by the Arts Commission as a separate document. San Francisco’s Public Art Program, one of the first in the country, was established by city ordinance in 1969. The Art Enrichment Ordinance provides for 2% of the construction cost of civic buildings, transportation improvement projects, new parks, and other above-ground structures such as bridges, to be allocated for public art. It also provides an allowance for artwork conservation funds and allows for the pooling of art enrichment funds for interdepartmental projects. Circumstances that would allow construction projects to be exempt from public art allocations are also defined. The Public Art Program provides curatorial expertise and project management for the implementation of the city ordinance. It is administered through the San Francisco Arts Commission, and is overseen by the Visual Arts Committee (VAC) of the Commission. The Public Art Program promotes a diverse and stimulating cultural environment to enrich the lives of the city’s residents, visitors and employees. The Program encourages the creative interaction of artists, designers, city staff, officials and community members during the design of City projects, in order to develop public art that is specific and meaningful to the site and to the community. Public art is developed and implemented in conjunction with the overall design and construction of each project. The Arts Master Plan deals as expansively as possible with the arts, not just as sculptural objects and physical enhancements commissioned through a public process, but as a living part of any community. Art can enhance the community’s collective sense of identity, defining place and offering a site for the community’s collective memories and stories. Art, art organizations and artists contribute to the economic and cultural vitality of an area, providing incentives for people to visit the area and indirectly encouraging other businesses. Art can offer a window to much of what has vanished or is invisible in the area by narrating the history of a space. This might include revealing or celebrating the ecology and typography of an area, as well as its people and cultural institutions. It is also helpful to look at examples of successful projects in other public spaces, as well as to consider what specific sites and features of this neighborhood offer opportunities for art. One way of thinking about art and its role in the plan area is to consider its relation to various broad themes including Place, Community Identity, Geographic history and Economic Development. Defining place in a neighborhood includes identifying the boundaries and the central focus of a physical area, as well as exploring how art can announce a community’s identity. This amplifies the experience of arrival or ceremony when visiting a particular neighborhood space. Large-scale sculptures, such as entry columns or sculptural light fixtures, can make a strong impression on visitors and can become symbols of a community that are deeply loved by its residents. On Ocean Avenue artist-designed gates, sculptural columns or archways over Ocean Avenue could enhance the street as well as frame entrances to the commercial district. Benches, clocks, water fountains, and other types of functional furniture, when designed by artists, offer a sense of surprise and beauty to the street. Other place-defining artwork of a significant scale that can be viewed from the adjacent freeway, or experienced while in motion, can evoke curiosity about Ocean Avenue as a destination. What makes the neighborhoods of the Balboa Park Station plan area unique? What things are common sources of pride for its residents? What aspects of the community evoke a different time or provide a distinct perspective on the world? There are numerous examples of these special places, reflecting its history both as a rural and urban site that residents are eager to share with visitors. The gymnasium in the First Presbyterian Church on Ocean Avenue, for example is a veritable Sistine Chapel of African American cultural and sports heroes. Cayuga Park is a pantheon of fantastic hand-carved sculptures and garden pathways created by city gardener Demi Braceros. These sites and others recall a particular moment in the history of the area, speaking to the diversity of the communities that surround the plan area. How can these secrets of the place, often known only locally or by just a few, be shared and acknowledged? How can art evoke memories and preserve the community’s history? On a street scale, embedding stories mosaics, medallions or historical signage on the street enables history to become accessible to everyone on a daily basis. Local heroes and narratives can be articulated through quotes, anecdotes, depictions and descriptions of historical events in various media. Projections of movies, photographic or moving images onto old movie houses like the El Rey Theater designed by Timothy Phluger (now a church), or on storefronts along the street, could enliven the street at night and offer history lessons to the community. Study of historic maps can provide clues as to how and why a community evolved over time. Family photos and stories are valuable resources in developing a history of the area. The geography of the plan area has had much to do with shaping its current existence. To the south the hills slope off towards Daly City. The area is exposed to both the ocean (to the west) and the Bay (to the east) creating a confluence of cool ocean air and warmer bay breezes which makes this a neighborhood that is frequently foggy, windy and cool. Ocean Avenue passes along a valley formed between outcroppings of rock. Merced Heights and Ocean View are to the south. Brooks Park, situated on one of these outcroppings, offers a view of Pt. Reyes to the north and the Farallons to the west. This southern point of the city is its narrowest point east to west, while Ocean Avenue and Geneva form a main east to west corridor extending from the ocean to the Bayshore. The wind and cool air inspire possible ideas for phenomena-based art works. Water is essential to survival of humans and all forms of life. Historically communities grew up around streams and springs: water formed a central feature of their economy and was essential to their survival. Water in this area has a long history that refuses to go away. It emerges as water flooding up through the basements of homes and schools along Cayuga Ave. This water is traceable to Islais Creek, still visible above ground as it flows into the bay on the eastern edge of the city and to springs in the Excelsior Area to the east of Balboa Park. Its sound can be heard in the culverts and sump pumps of private residences. In addition to the groundwater, there were flumes that traversed this area in the early 20th century bringing water to the city. Spring Valley Water Company owned large tracts of land in this area and ran water through the area. The Islais Creek bed which degenerated into an open sewer for the tanneries on its bank, was culverted in the early 20th century. The sound of water in the creek-bed was replaced first with the sound of rail transit with Southern Pacific Railway and then with cars after the construction of Interstate 280. Artists working with the school district have used the hidden water of Islais Creek to irrigate a school garden at Denman Middle School. Additional projects could identify the water under the community, perhaps marking a segment of the creek. This could be extended to above ground structures and street furniture incorporating water imagery. In Los Angeles, Blue Line Oasis, a mosaic and stone replica of an artesian well by artist Lynn Aldrich, enlivens the Artesia Metro Rail Station entrance and makes reference to a bygone era. The arts and artists often form a vanguard to economic development, appropriating and improving facilities that are undesirable with seat equity, subsequently attracting other businesses to the area. In San Francisco’s SOMA and Mission neighborhoods, are areas that have been enhanced by the influx of and building upgrades initiated by arts organizations. The high-ceilings of the Geneva Office Building suggests an opportunity for a nonprofit arts organization to take up residency. This kind of activity could establish a precedent for the ongoing usage of the building in support of the arts. It could also stimulate other ancillary business developments in the neighborhood. INTEGRATE ART INTO THE FABRIC OF THE NEIGHBORHOOD. Many of the publicly-financed projects discussed in this plan will generate art enrichment funding to commission permanent, public artworks through the San Francisco Arts Commission. Other sources of local, municipal funding would be appropriate for smaller or temporary projects, while funding on a national level could provide the means to realize more ambitious, community-initiated projects. The scope of the City’s Art Enrichment Ordinance should be broadened in the plan area. Many of the new facilities and physical improvements suggested in this plan will be implemented under the auspices of the city and will thus be subject to the Art Enrichment Ordinance. In the plan area, the scope of the program should be broadened so that art is an integral component of all municipal construction projects and major urban design endeavors. Non-city public agencies and institutions should be encouraged to take part in the 2% for art program. Several non-city public agencies and institutions (BART, City College, Caltrans, San Francisco Unified School District) will be involved in building new facilities in the plan area. These entities are not subject to San Francisco’s Art Enrichment Ordinance (though some have programs of their own). These agencies should voluntarily take part in the city’s program, or coordinate with it if they already have their own art enhancement programs in place. The arts and artists should be integrated with the overall design of new buildings, facilities and public opens spaces. Often when artists are involved in the design of a new facility, they are brought in near the end of the process and are asked to design projects that are standalone or surface decoration. Though sometimes well-executed and compelling, these art projects miss the opportunity to allow artists to contribute from the beginning of a design project. Artists should be involved from the very beginning of design on the facilities and projects outlined in this plan. In general, a collaborative design team comprised of an architect or landscape architect and an artist can greatly add to the richness and originality of a new building, transit facility or public open space. There are a number of research-related art projects that could involve the local community in meaningful ways. These are relatively inexpensive projects for which sources of local money may be available. The importance of these projects should not be underestimated. They may be endeavors that precede and form the groundwork in terms of research and community building for larger permanent public art works. They can enhance the sense of shared history and community participation, and may be important precursors to more permanent undertakings. The residents of this area have a strong sense of their neighborhood, of its history, and of their own diverse origins, but these stories are scattered among personal archives and not universally accessible. A project that collates and records this history could build a sense of shared and renewed identity and offer a shared resource to the community as well as to those who might create public art works later. Such a book might chronicle the various neighborhoods, include illustrations and stories, reproduce collections of personal photographic archives and feature both historic maps as well as those created by the community. Film and historical images of the area could be projected onto various sites along Ocean Avenue. An important aspect of street safety has to do with keeping the area lively at night. Community members have archives of historic photographs in slide form. These could be rear projected in an empty storefront, or projected onto the side of a building at night. The snapshots of this area collected by the public library’s history project could be used as well. Projections could rotate through the community or take place at fixed locations such as the exterior of the buildings that housed early cinema theaters on Ocean Avenue. Ocean Avenue transports a large volume of commuters. The fog and wind of the area make this a cold and inhospitable place to wait for trains. The design of a transit structure would be a practical and aesthetic enhancement of the streetscape. These transit platforms, which will be the most visible element of Muni’s K-Line improvments, could provide a defining characteristic for the street and neighborhood. The transit shelters along San Francisco’s Embarcadero, designed by Anna Murch, or the shelters on 19th Avenue, designed by Leonard Hunter and Sheila Ghuildini, are local examples of such structures. An artist and architect team would be most appropriate for this project. As sidewalk improvements are implemented in the plan area there is an opportunity to embed ideas about history/culture into the sidewalk as art projects. The African Kente textile weaving patterns incorporated by artists Gary Moore, Gerald Marston, and WRT Inc. into the Ninth Street Pedestrian Mall, an extended walkway in an African American community in Miami, Florida, is one example of a creative paving treatment. Additional enhancement of the street might include interpretive signage that provides continuity throughout the streetscape. These could include vertical markers or uniquely designed narrative signage designed to convey local stories through text and images. The Historical and Interpretive Signage Project on The Embarcadero, by artist Michael Manwaring and historian Nancy Leigh Olmsted, which tells the story of San Francisco’s waterfront, is a good example of this type of project. The sense of entrance arrival or importance offered by a symbolic entranceway is an essential element in providing a unique identity to a place. The Balboa Park Staiton Area Plan acknowledges the significance of such a gateway in relation to the City College entrance as a focal point on Ocean Avenue. The plan calls for a pedestrian plaza or park at the site of the current bus turnaround on the Phelan Loop. This site will also function as a gateway into the City College campus, presenting an opportunity for an artist to design light fixtures or other features such as a gateway into the campus. Alternatively a symbolic sculpture could be designed for this space. A work that is intriguing and perhaps changing, perhaps pwered by wind, would be interesting for passersby to contemplate. Various open spaces have been proposed in the Phelan Loop Area as well as the Transit Station Neighborhood. Each suggests an opportunity for adding whimsical embellishments public open space environments. Sculptures of animals that children can climb on would be appropriate for a children’s playground Other artwork such as outdoor furniture or water fountains could enhance open spaces adjacent to residential neighborhoods or neighborhood parks. Ongoing development in the plan area will potentially provide opportunities for artistic enhancement. For example, the new Ingleside branch library on Ocean Avenue will generate art enrichment funds for new public art projects. As with the artwork by Colette Crutcher and Mark Roller, on the façade of the Ocean View Library, artwork could be incorporated into the exterior of the building, providing street appeal and neighborhood beautification. This area, with its overlay of transportation interchange creates an opportunity to draw out the theme of transportation in the artwork. There are many possibilities: an artist project could integrate an icon or image similar to the Del Amo Wheel in Los Angeles, by artist Colin gray, a decorative cast-stone cartwheel incscribed with transportation-themed visual and verbal riddles, or to develop a site using elements from old MUNI street cars for seating. This could also be a place to tell the layered history of the Southern Pacific Railway, the evolution of the region as a hub for transportation in the city’s early days, and the introduction of the freeway through the landscape. The work might be iconic or intimate, functional or interactive. The rehabilitation of the historic Geneva Office Building -- which is likely to be the outstanding landmark and image-making building in the Transit Station Neighborhood -- offers extraordinary art-related opportunities. This building and its history is tightly linked to the rich history of rail transportation in San Francisco. Artists can and should be involved in the planning and design of the building’s renovation, in designing exhibits and elements of the building that illustrate this important and fascinating history. In addition, one of the most frequently-mentioned possible uses for the building is to house one or more arts-related organizations. Such an arts “hub” in the neighborhood, in combination with the many educational institutions in the vicinity, might begin to establish the arts as an overall theme for the new Transit Station Neighborhood. Plan adopted by Planning Commission Motion No. 17776 on 12/4/2008 and the Board of Supervisors Ordinance No. 0060-09 on 04/17/2009.